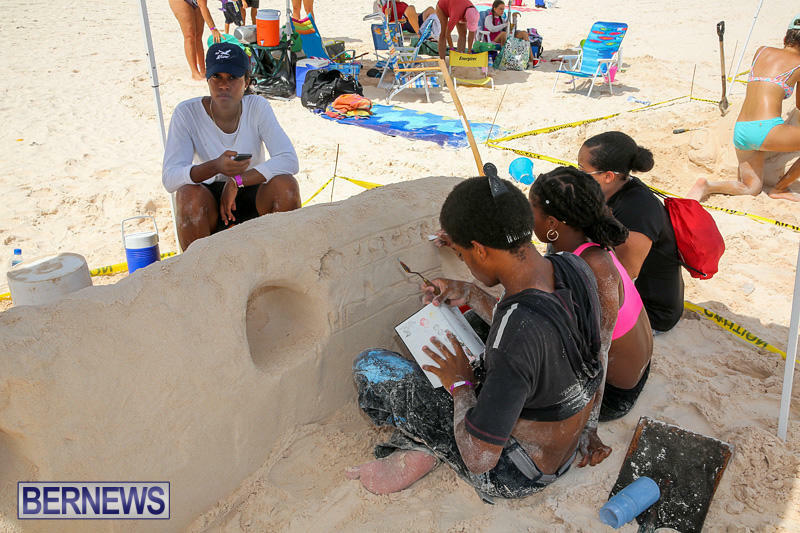 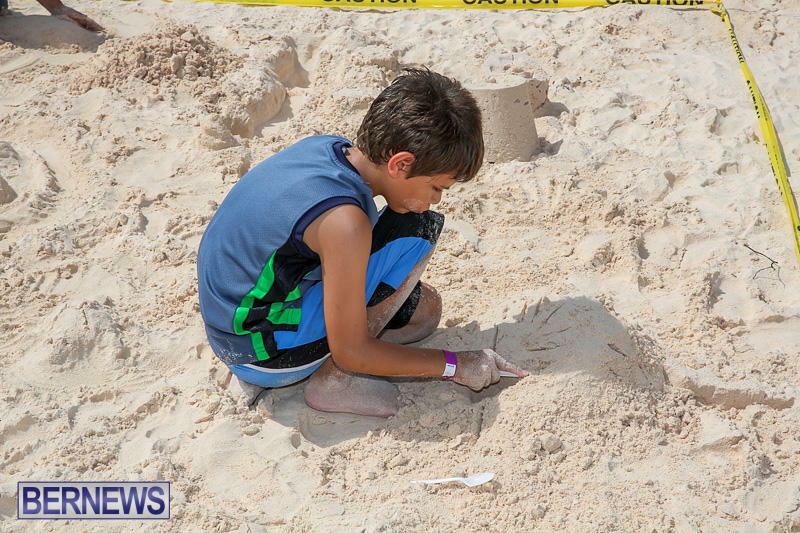 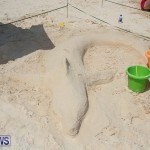 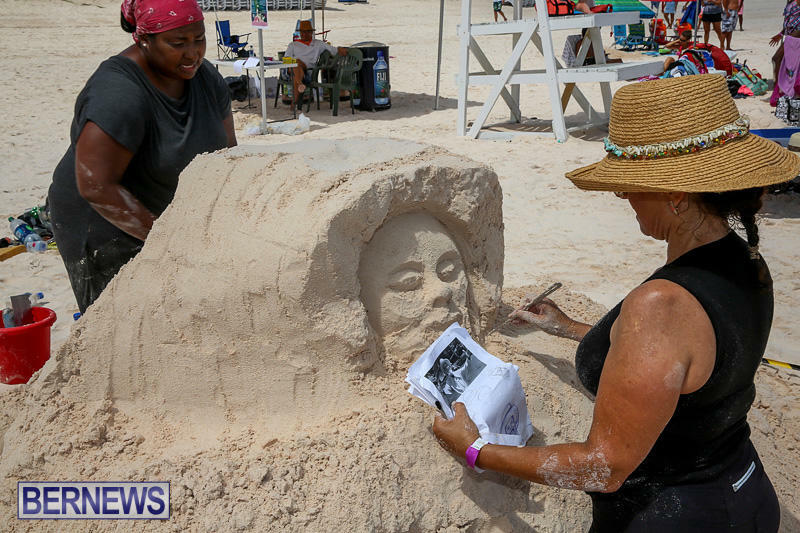 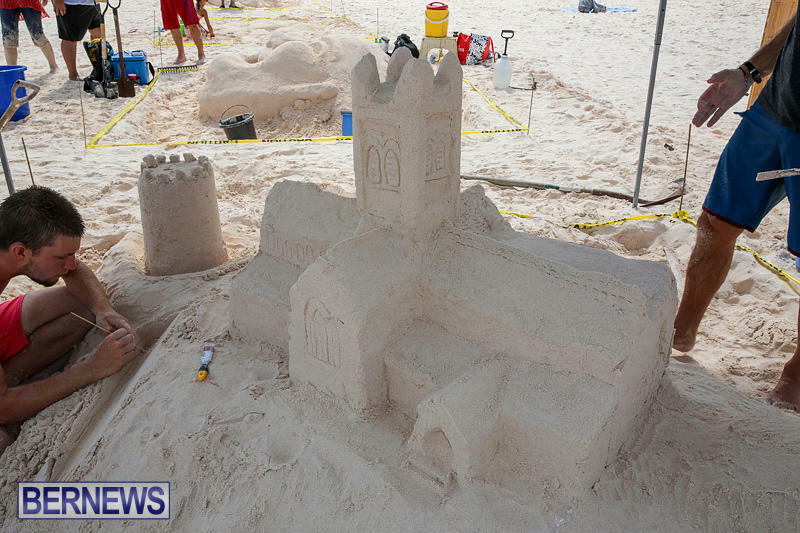 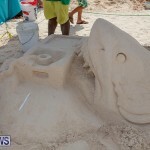 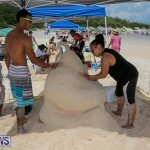 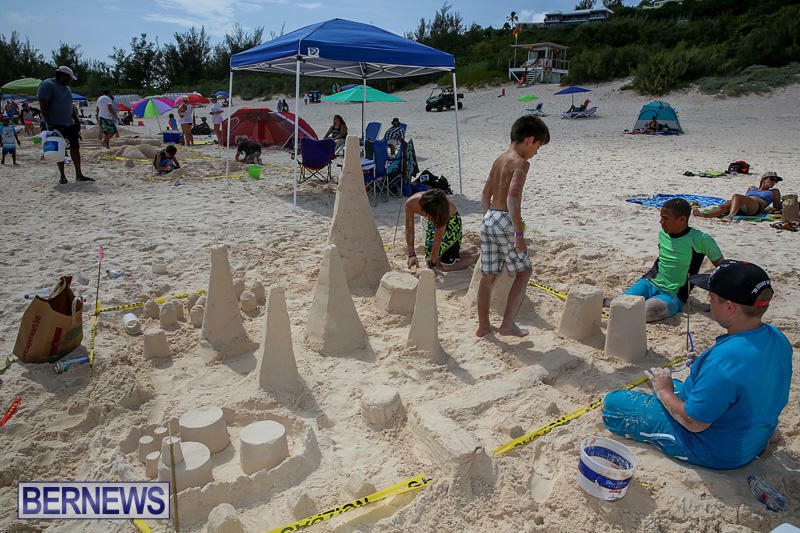 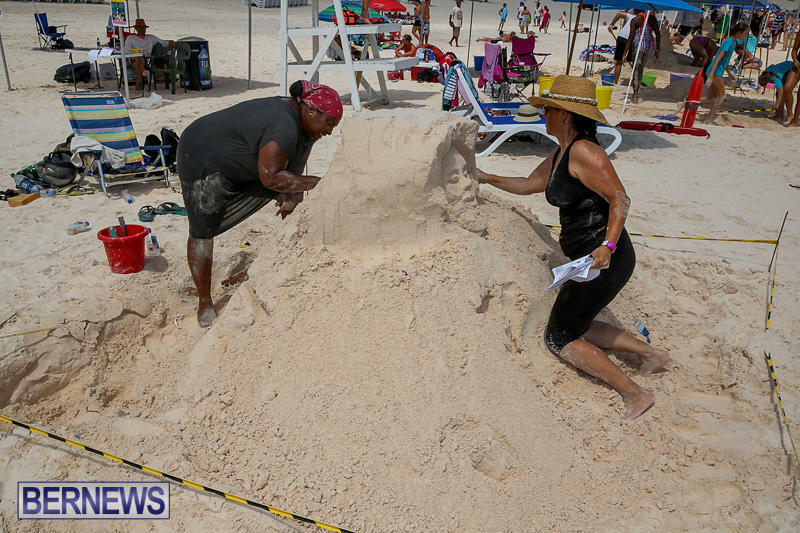 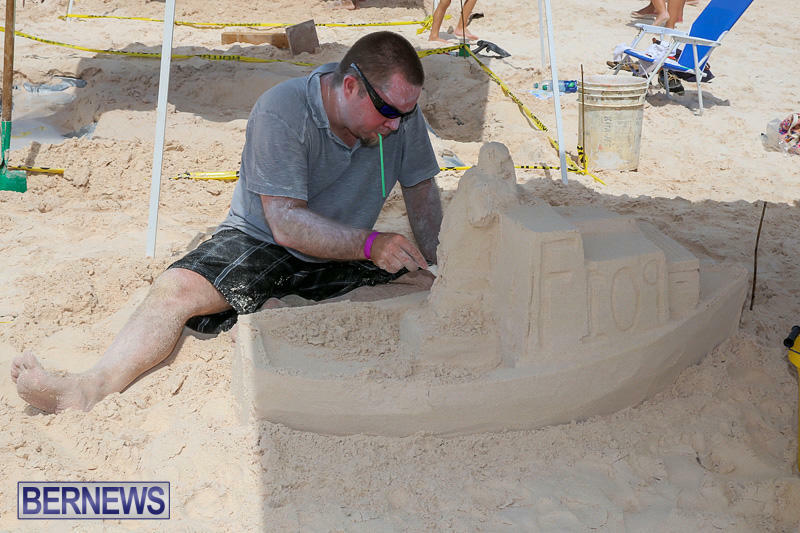 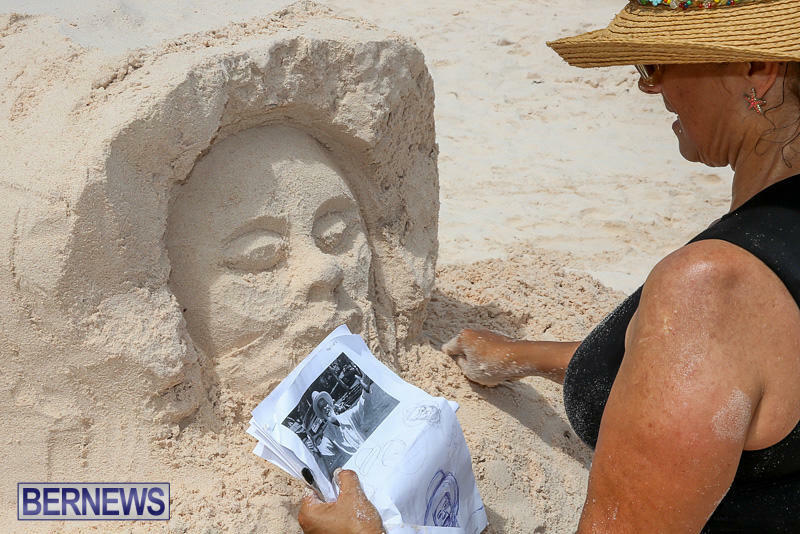 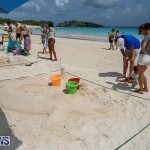 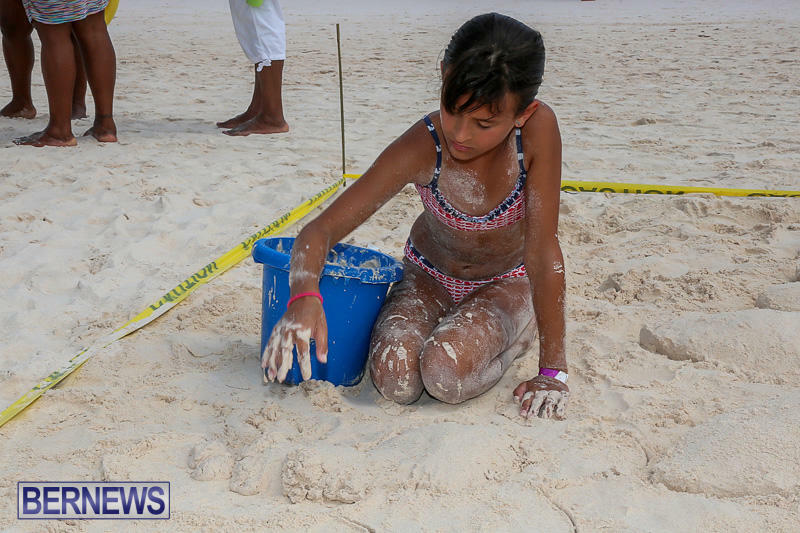 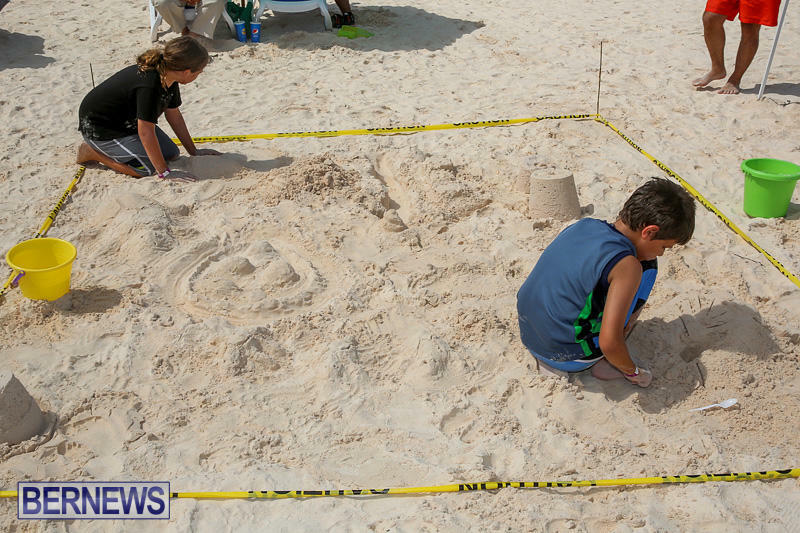 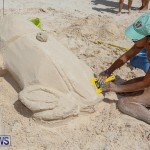 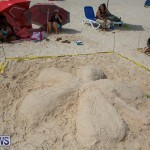 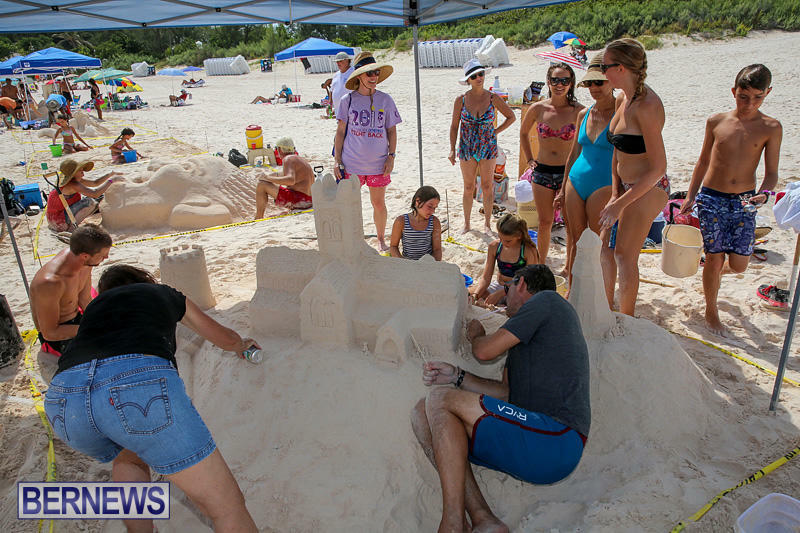 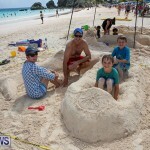 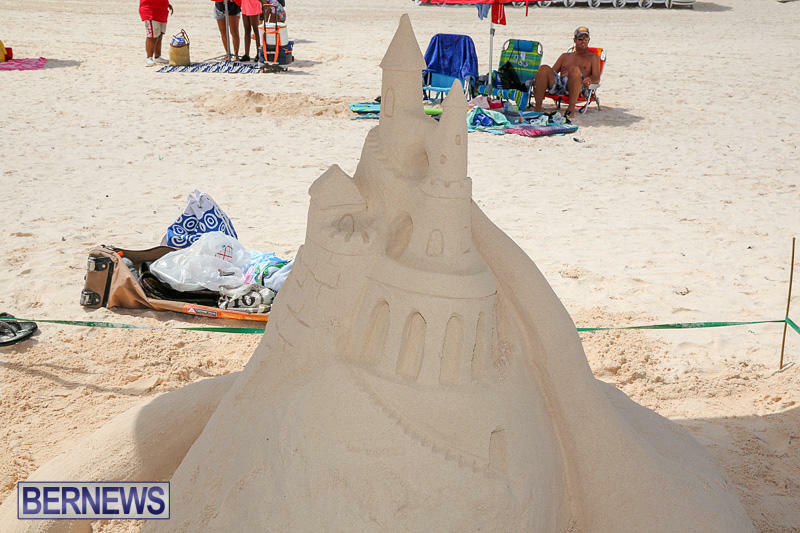 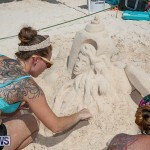 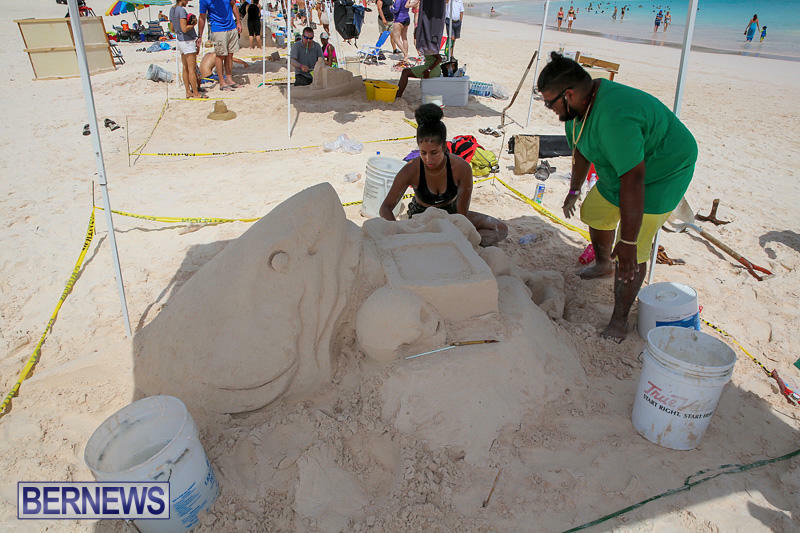 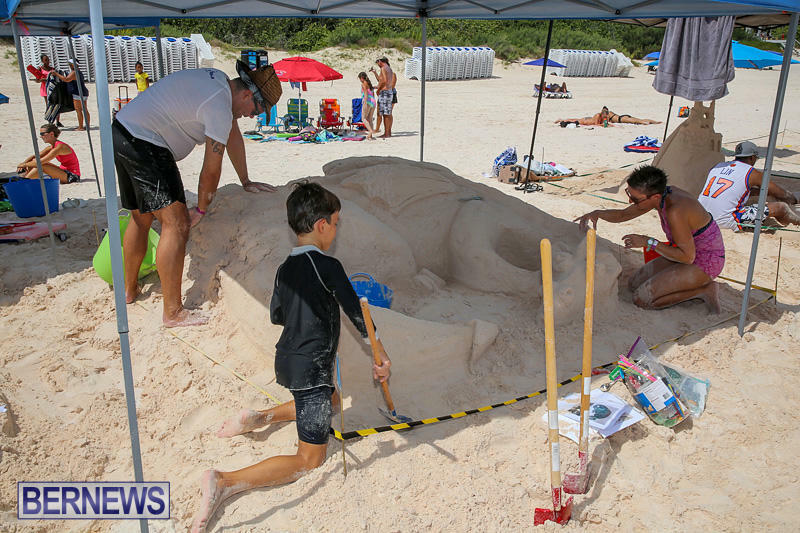 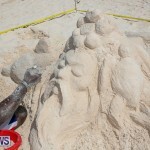 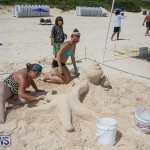 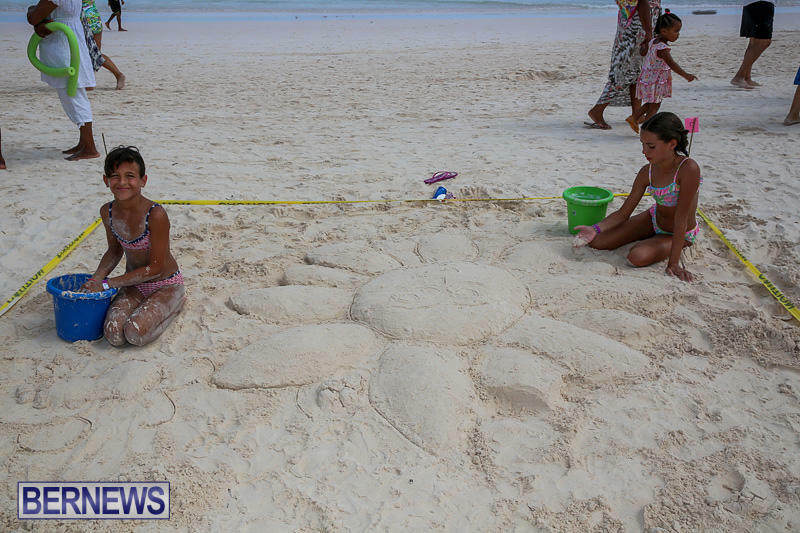 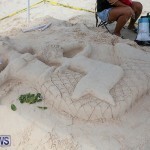 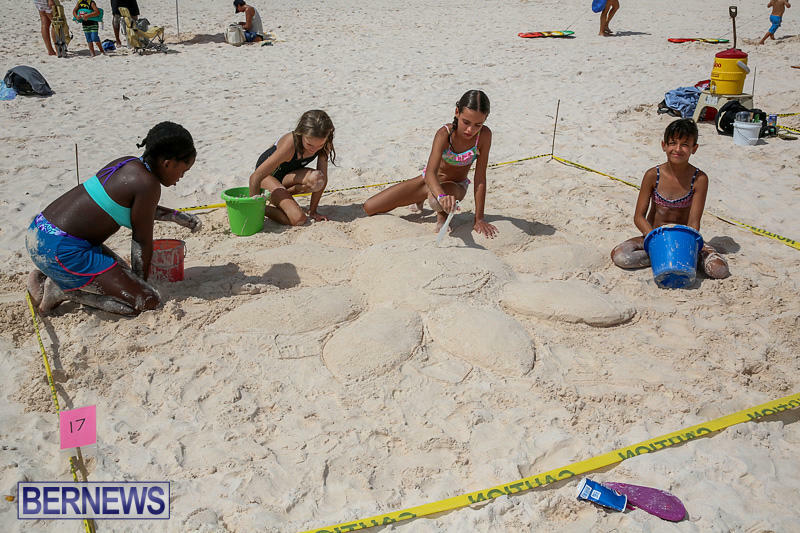 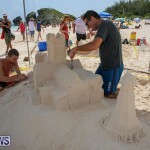 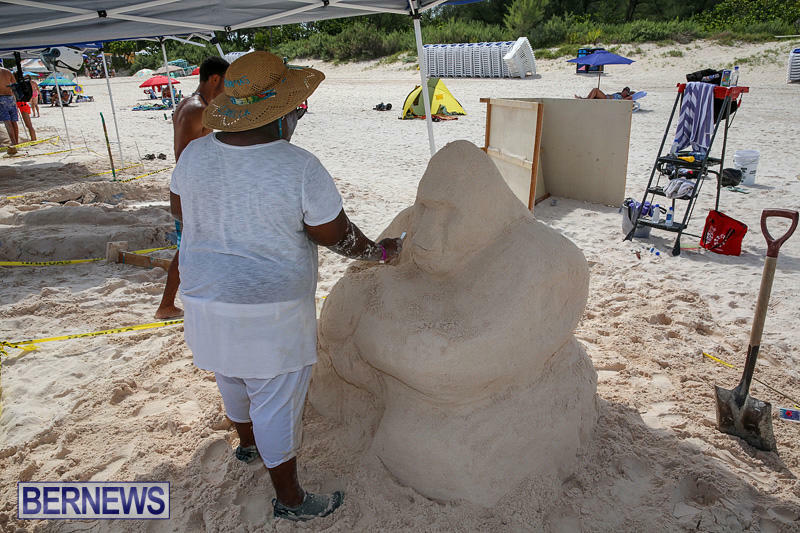 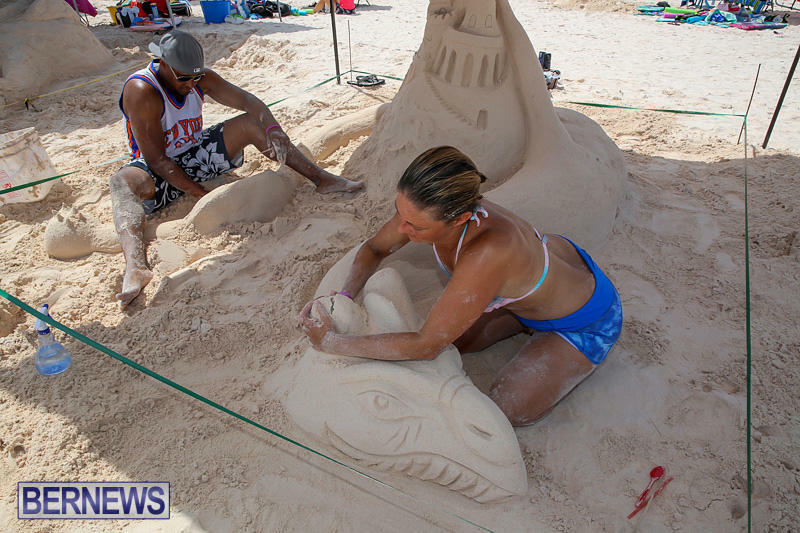 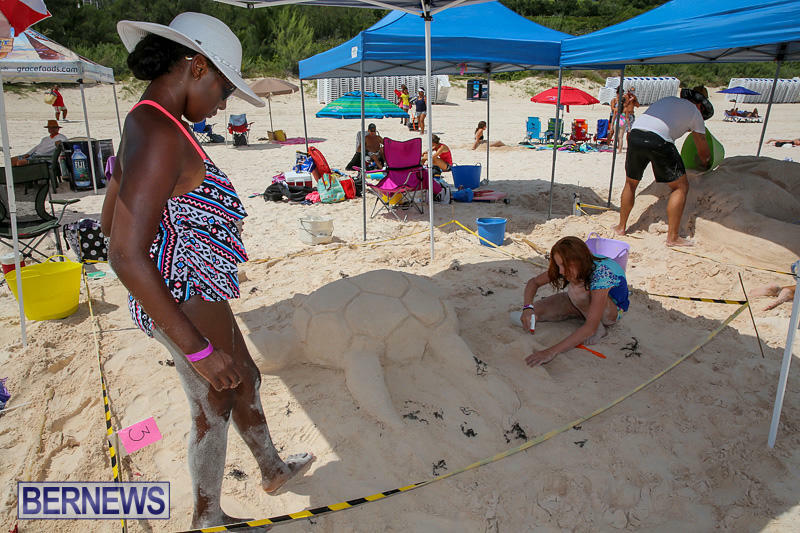 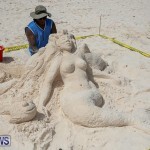 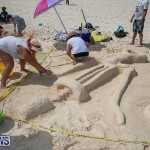 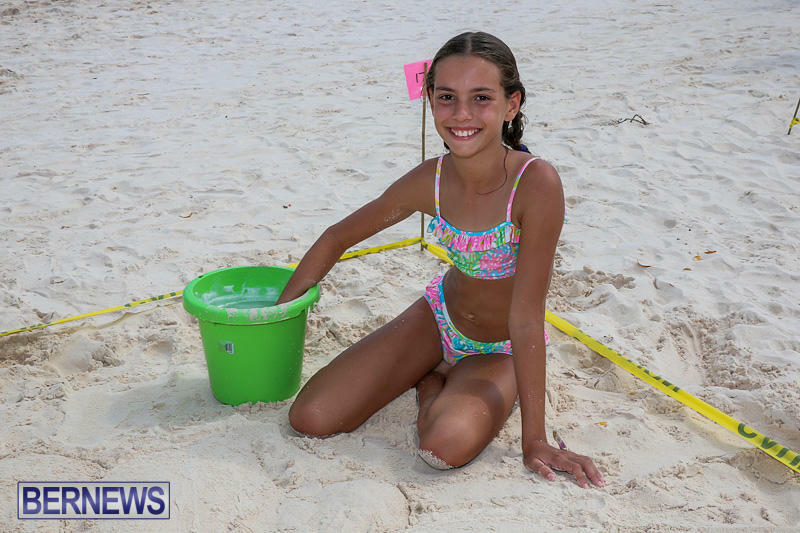 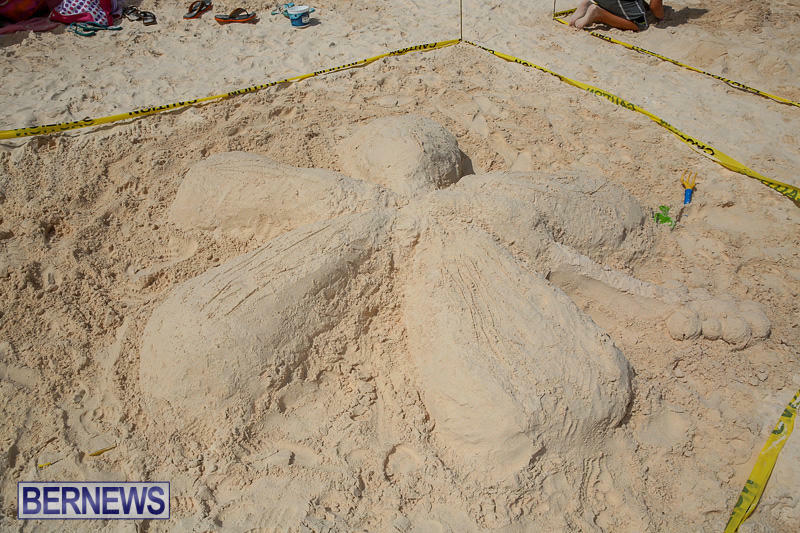 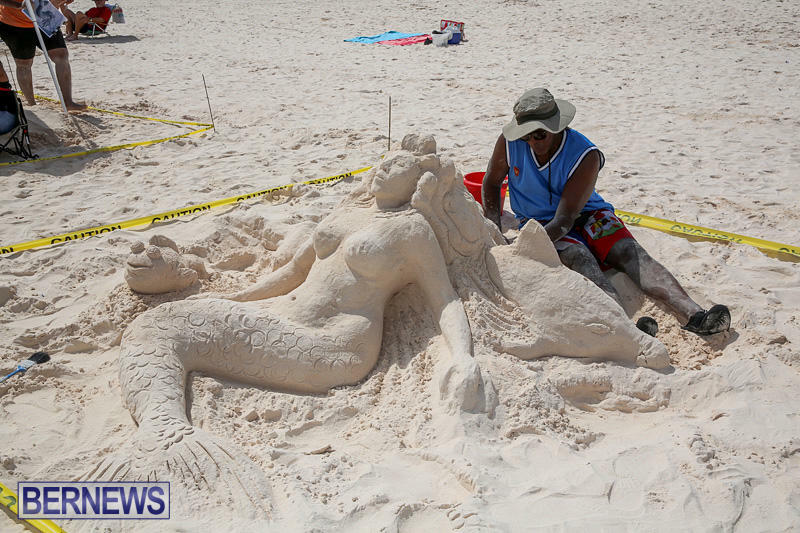 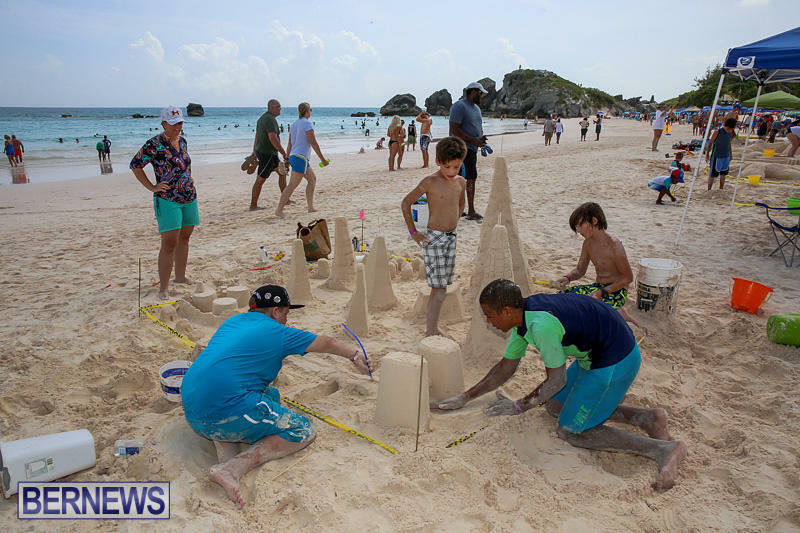 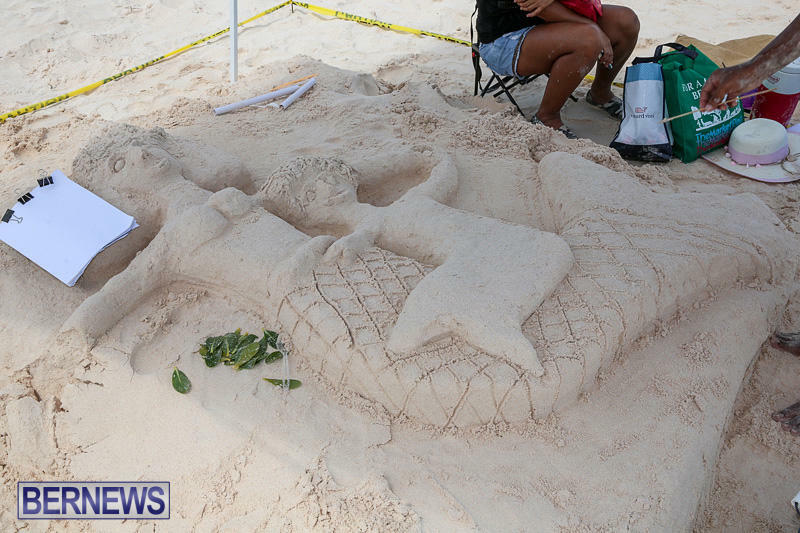 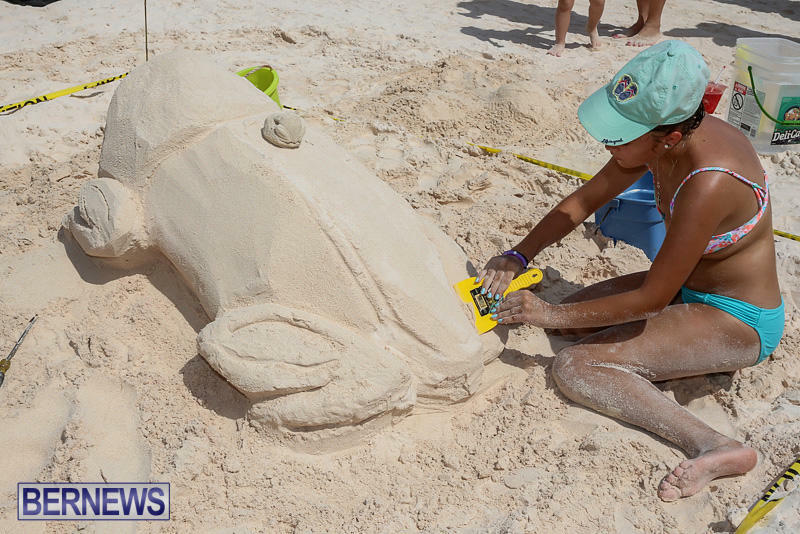 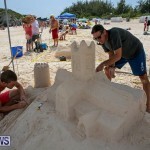 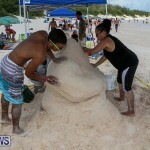 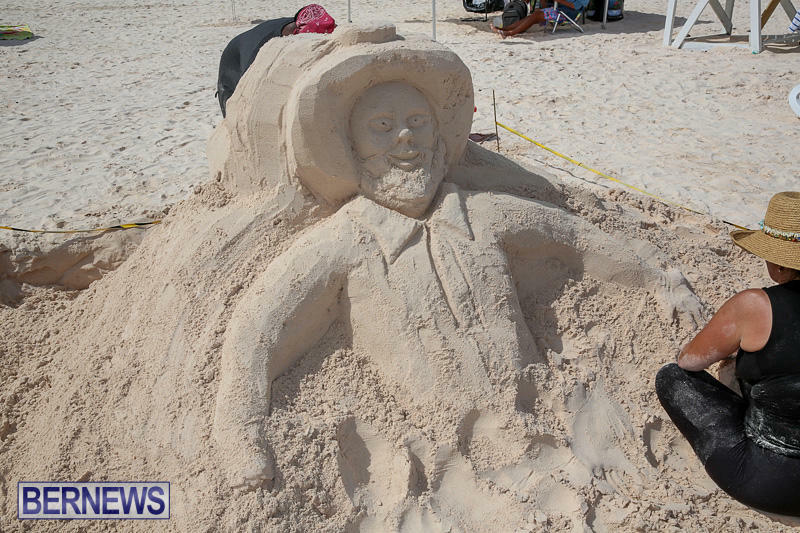 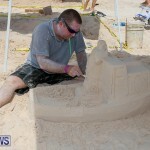 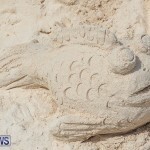 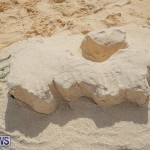 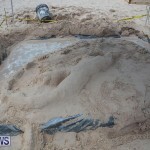 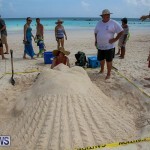 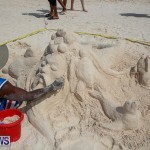 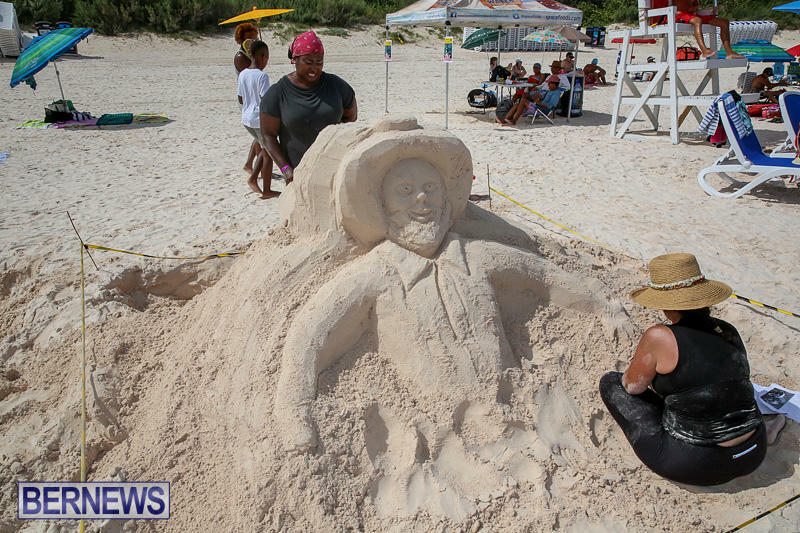 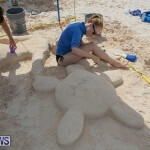 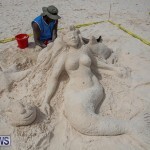 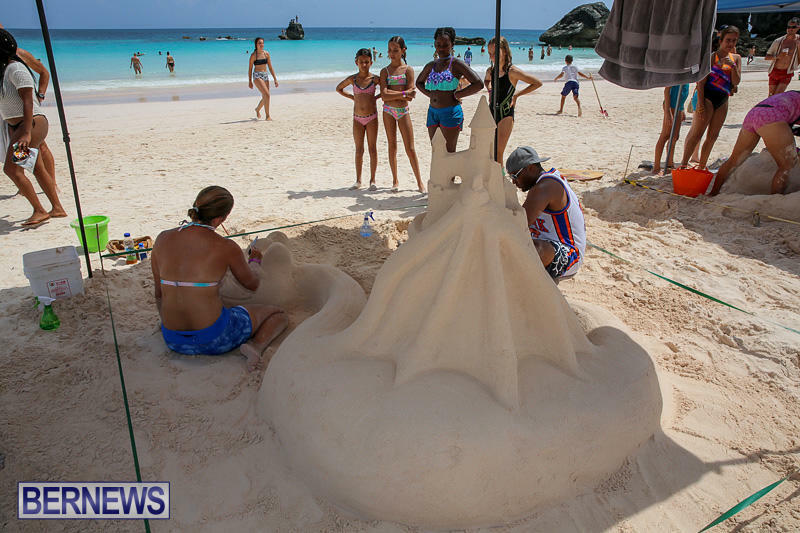 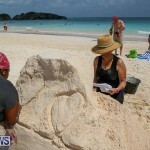 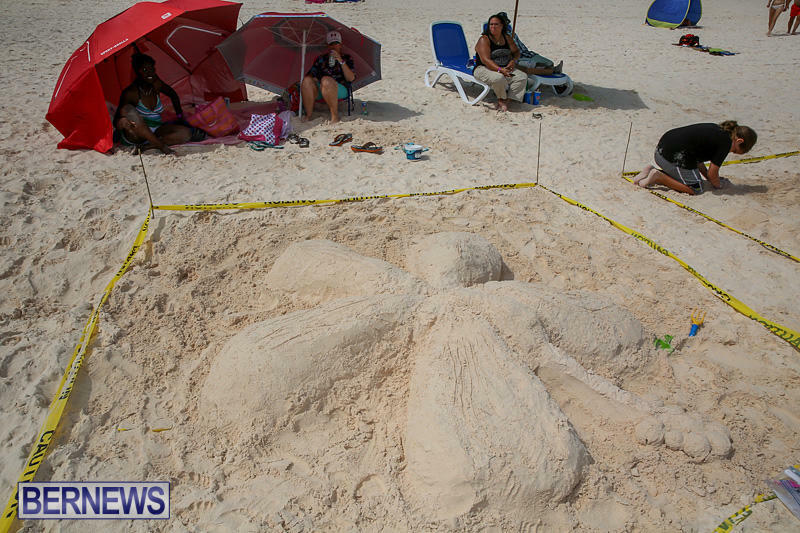 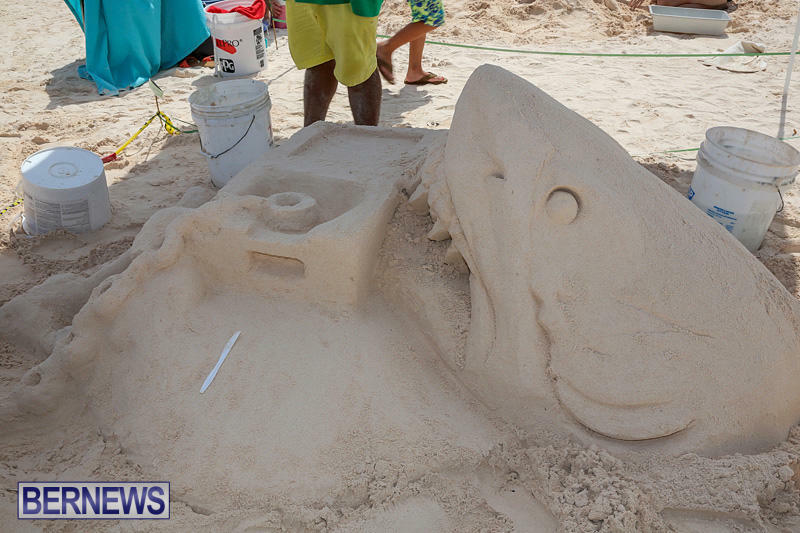 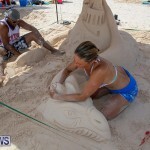 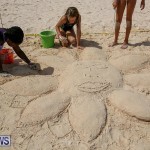 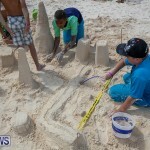 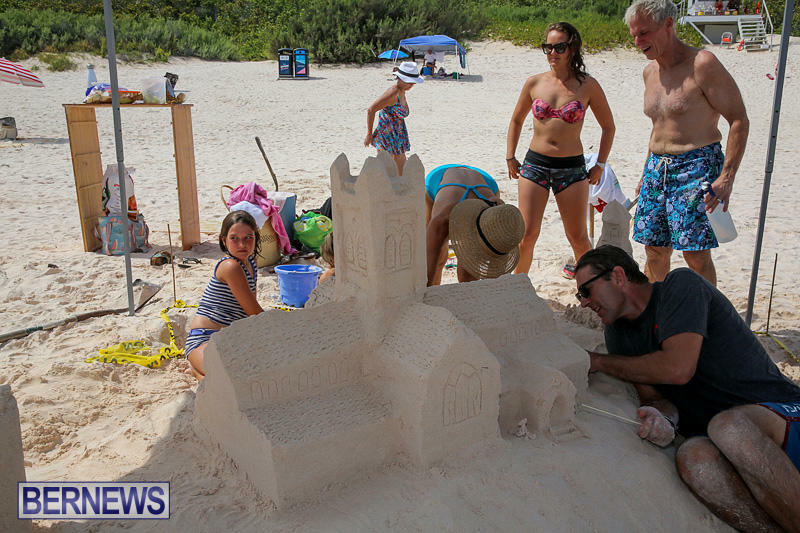 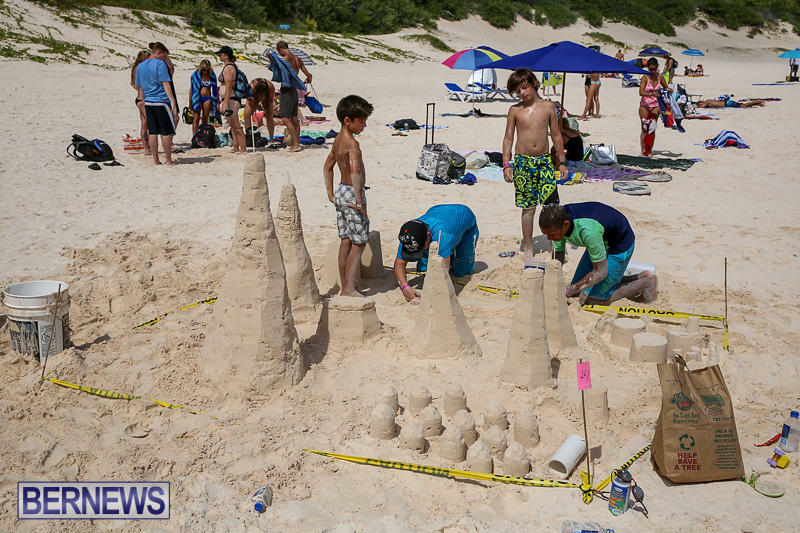 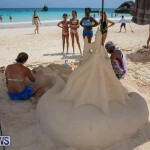 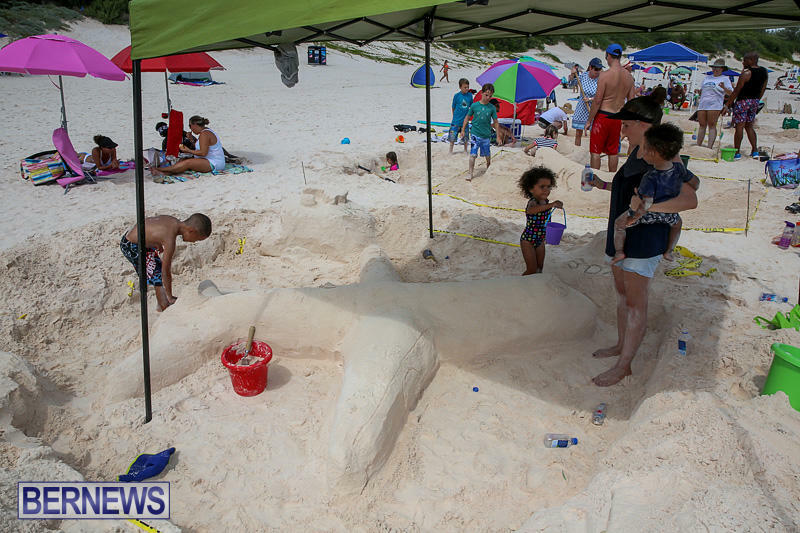 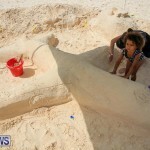 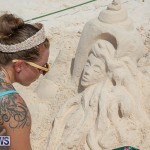 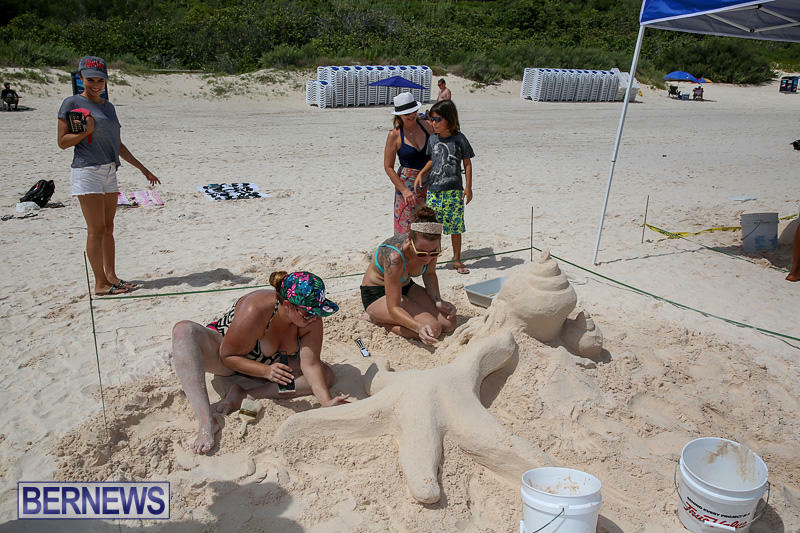 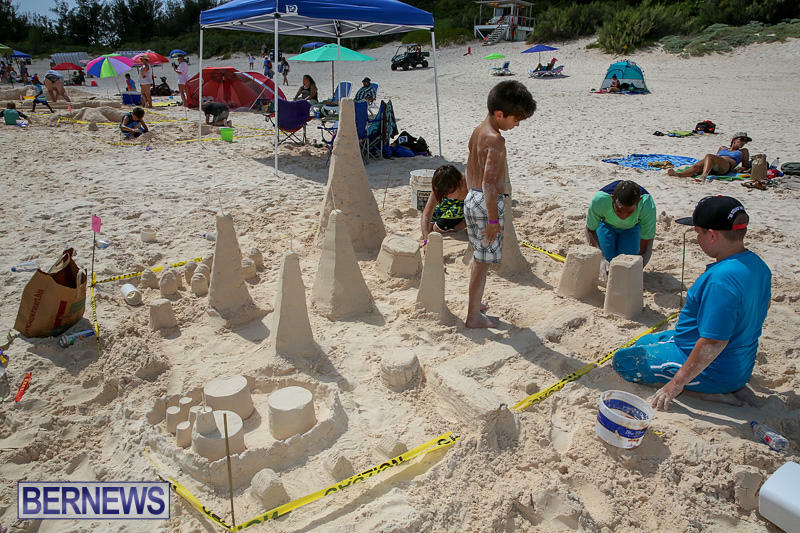 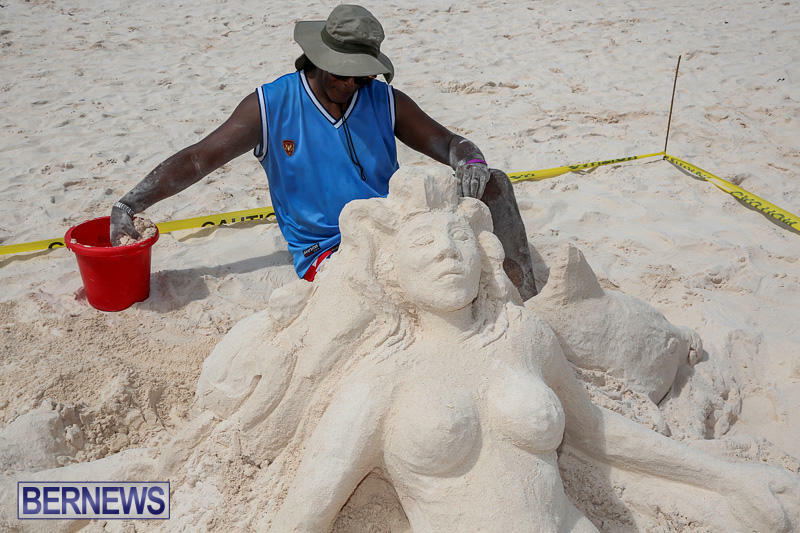 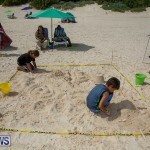 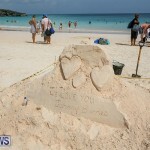 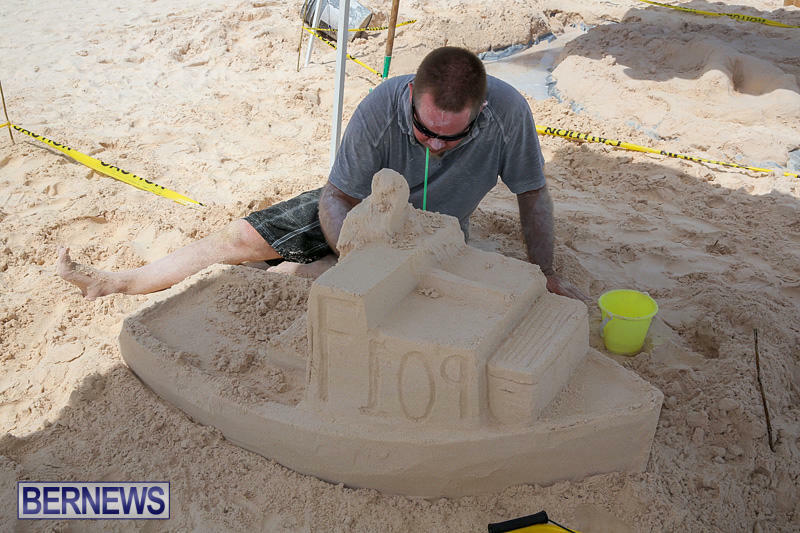 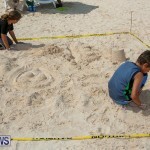 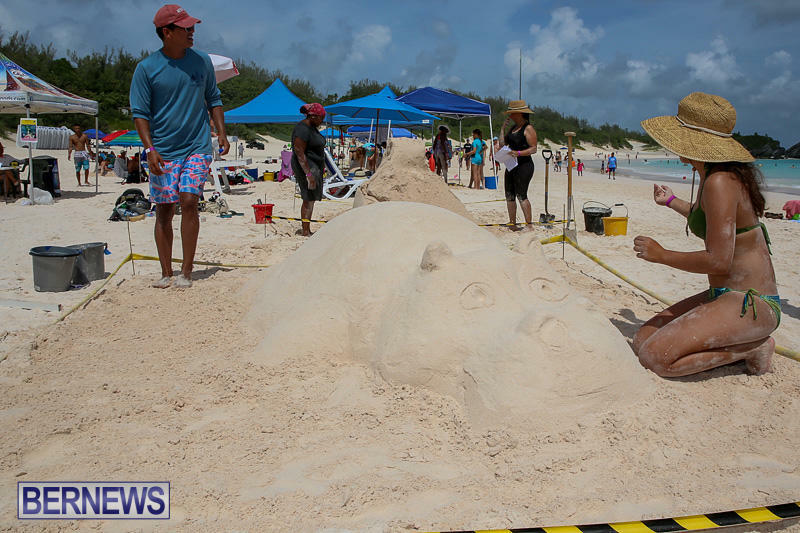 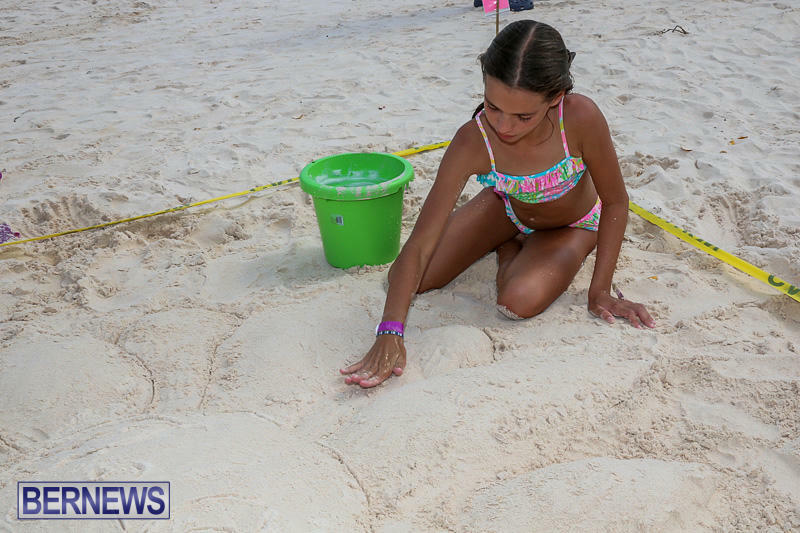 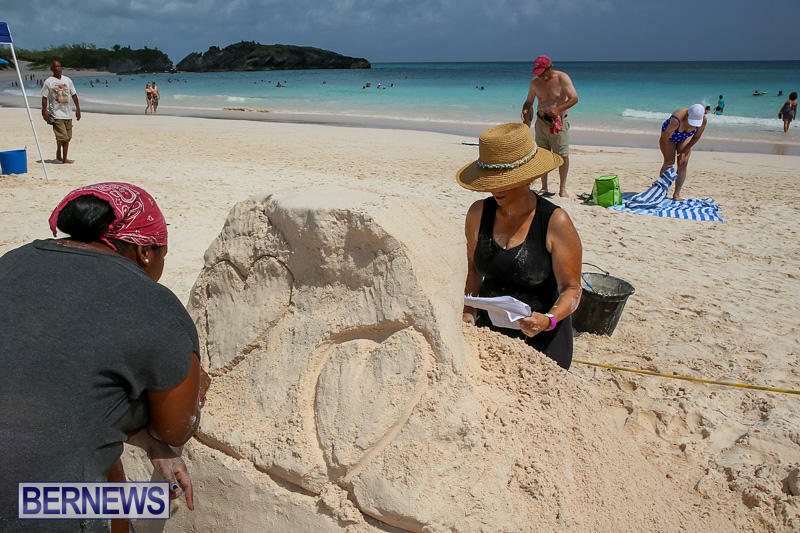 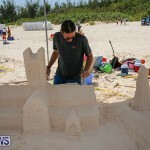 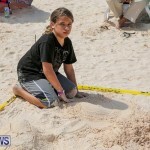 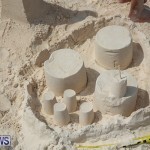 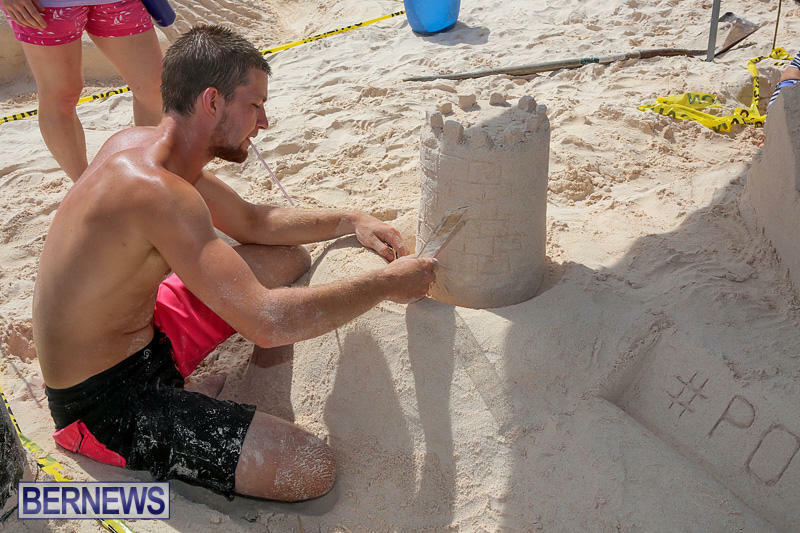 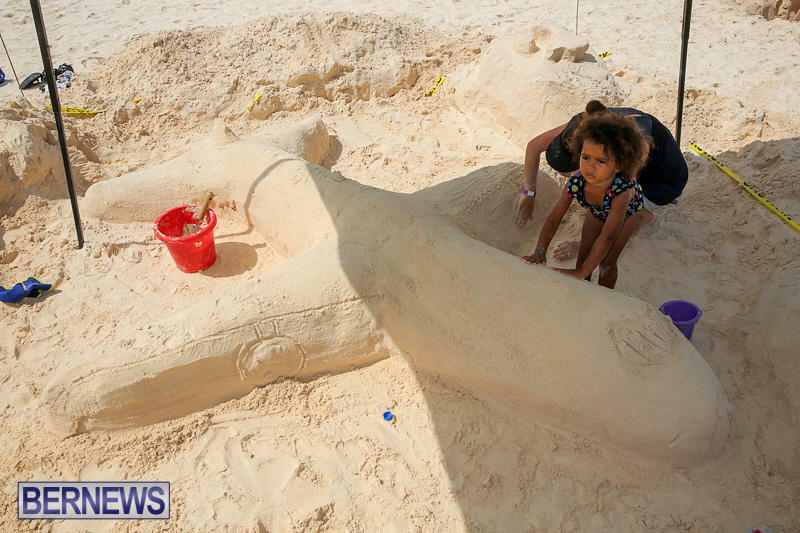 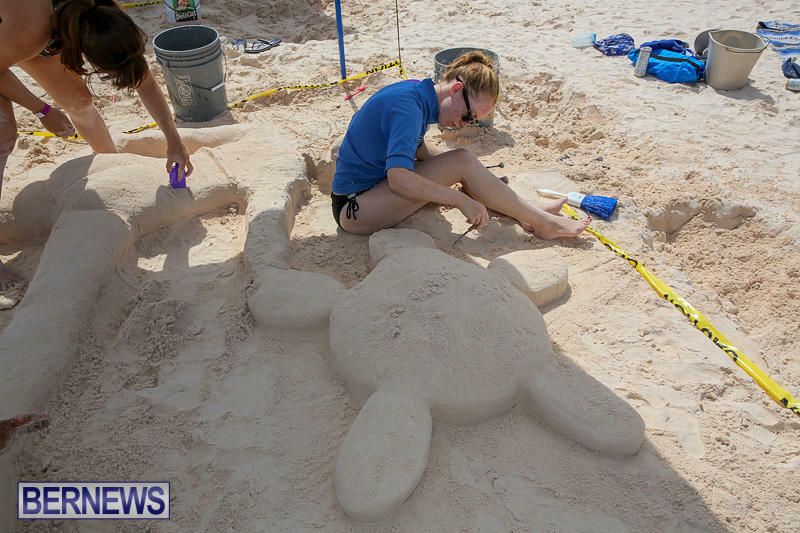 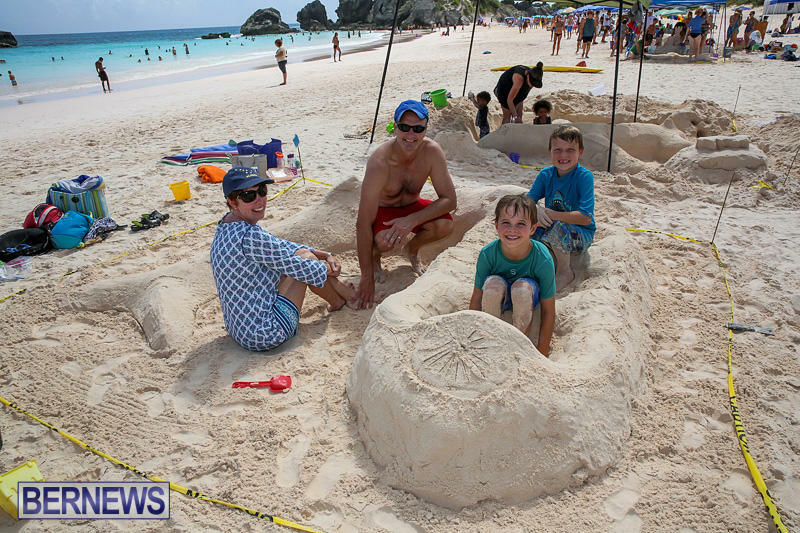 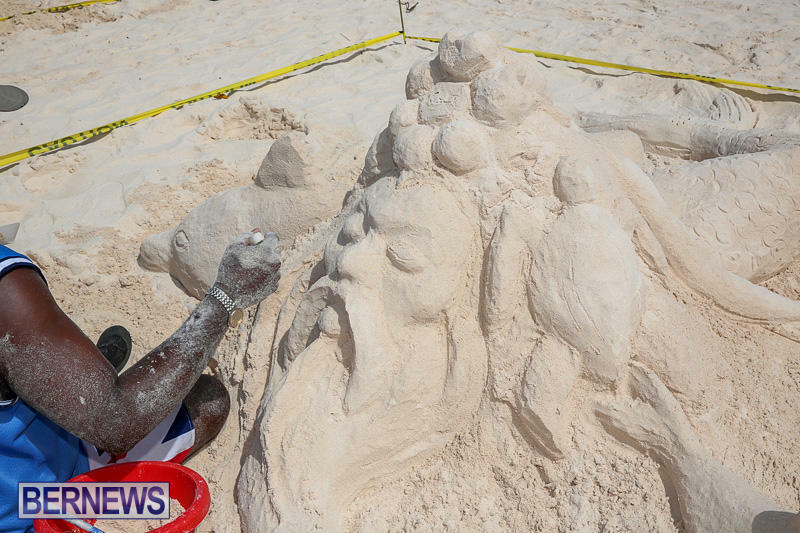 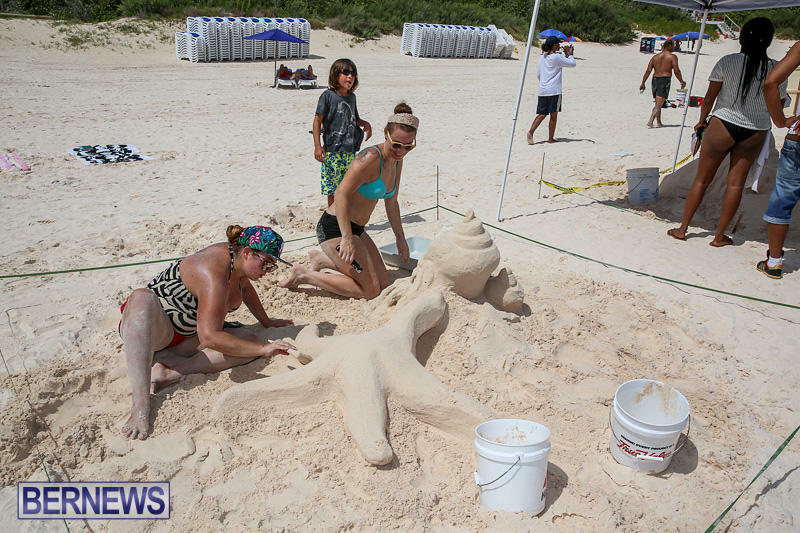 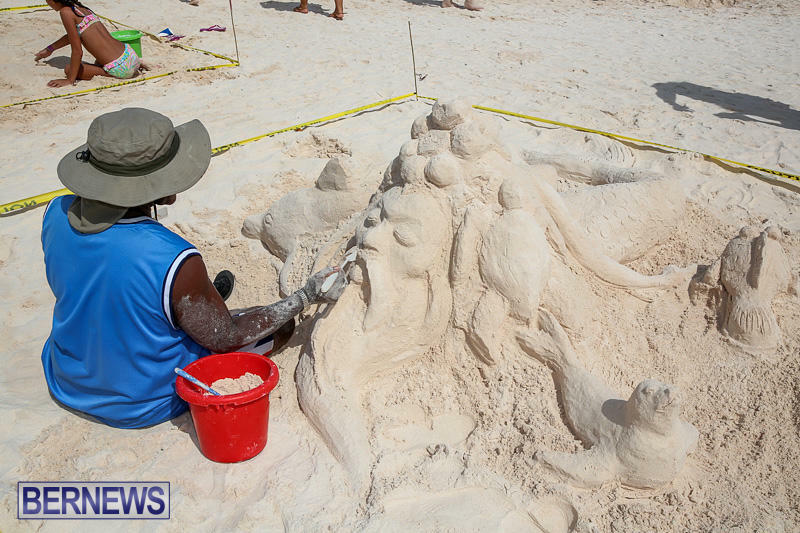 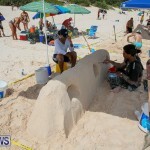 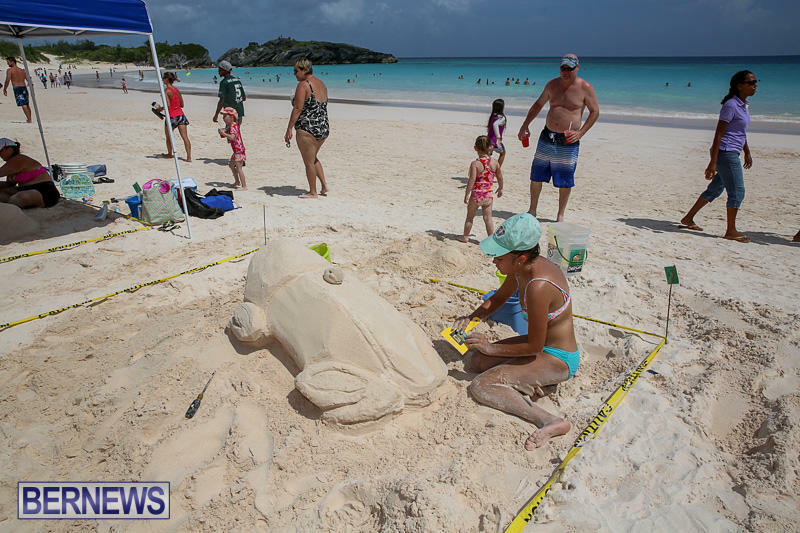 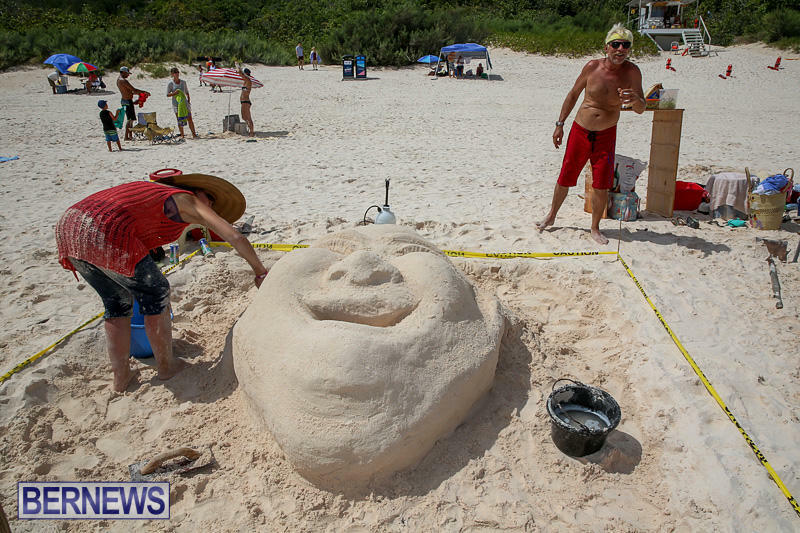 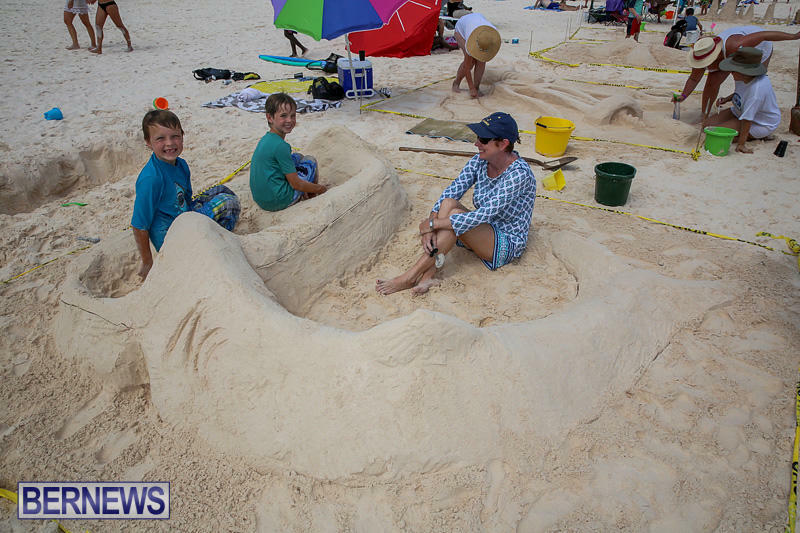 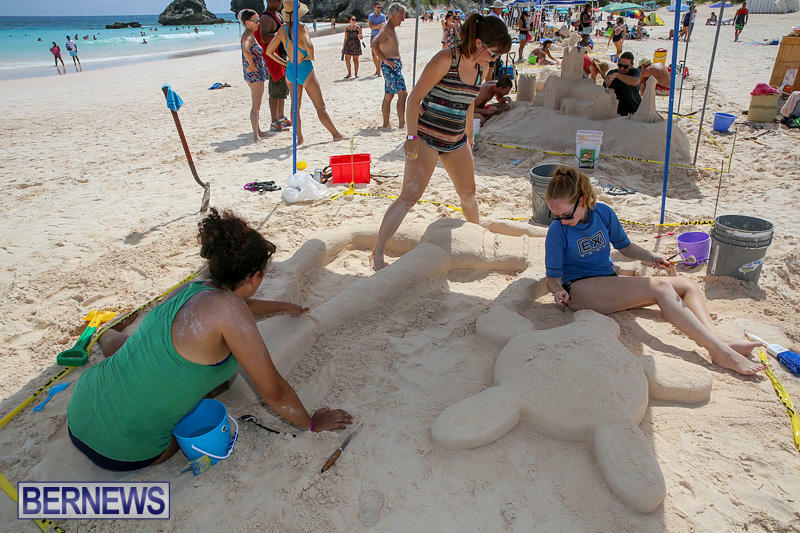 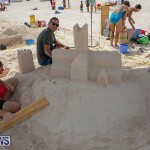 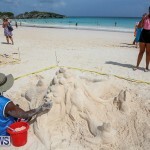 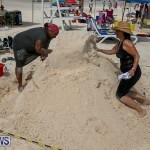 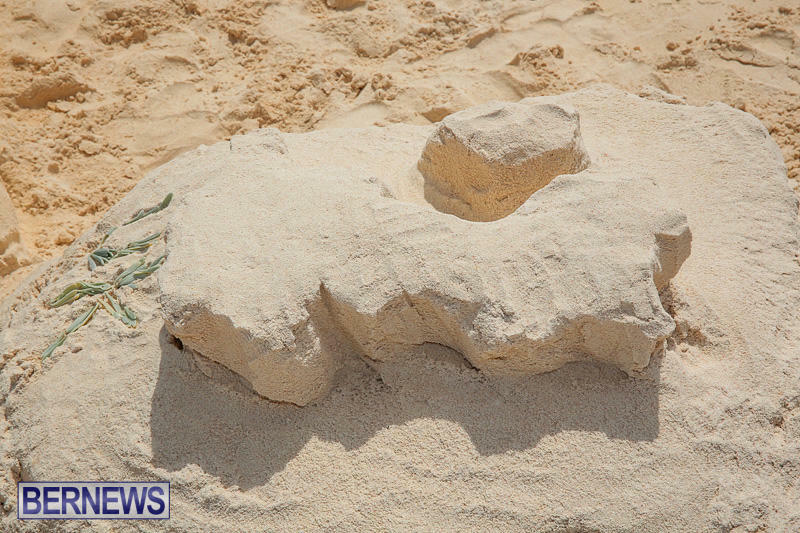 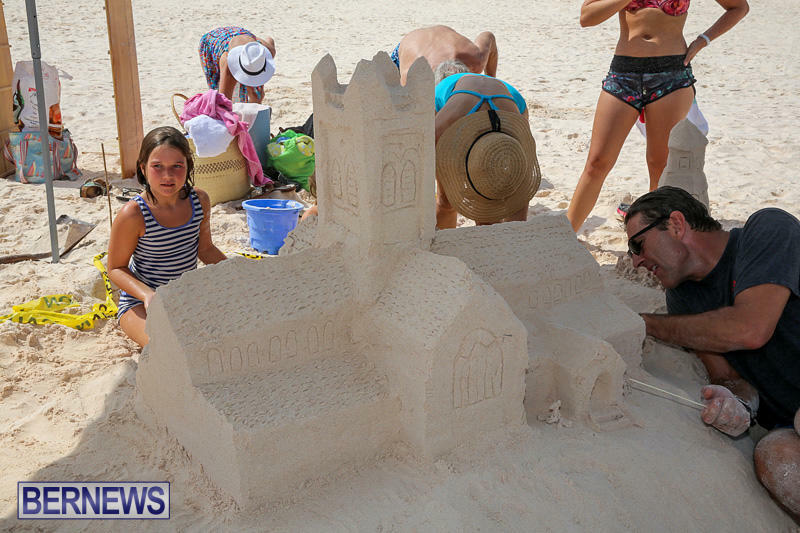 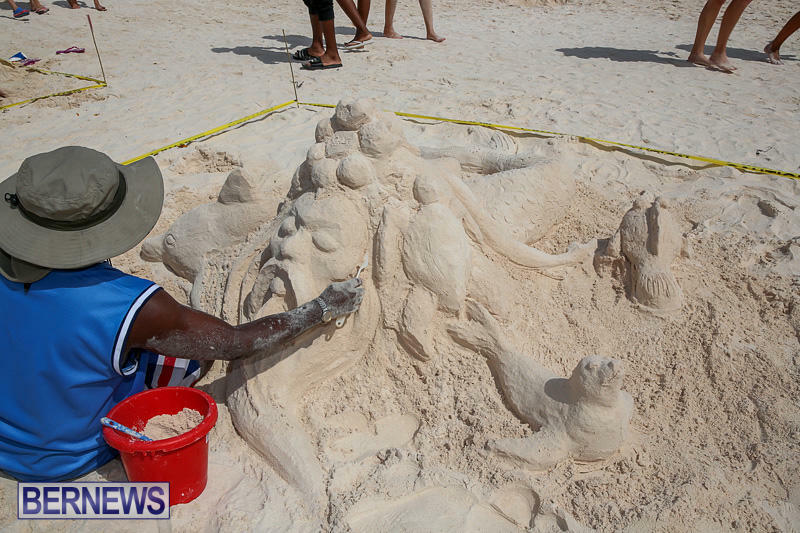 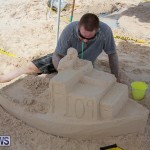 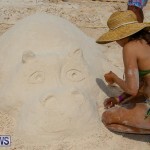 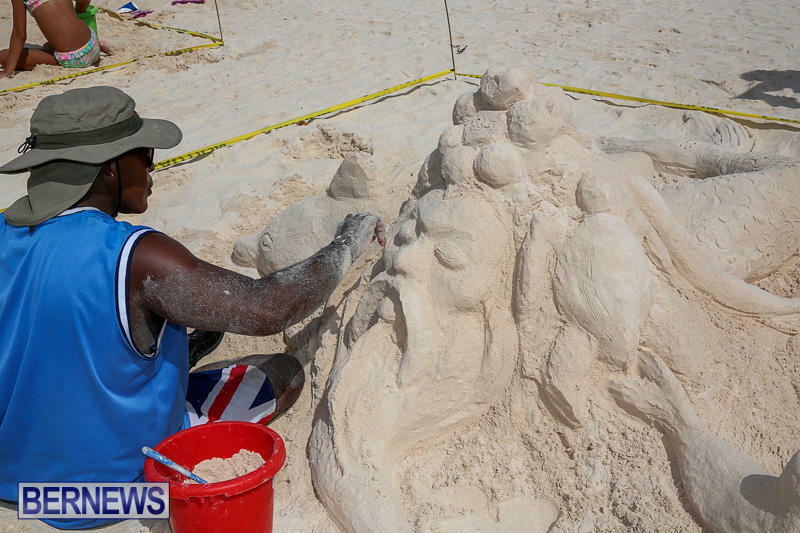 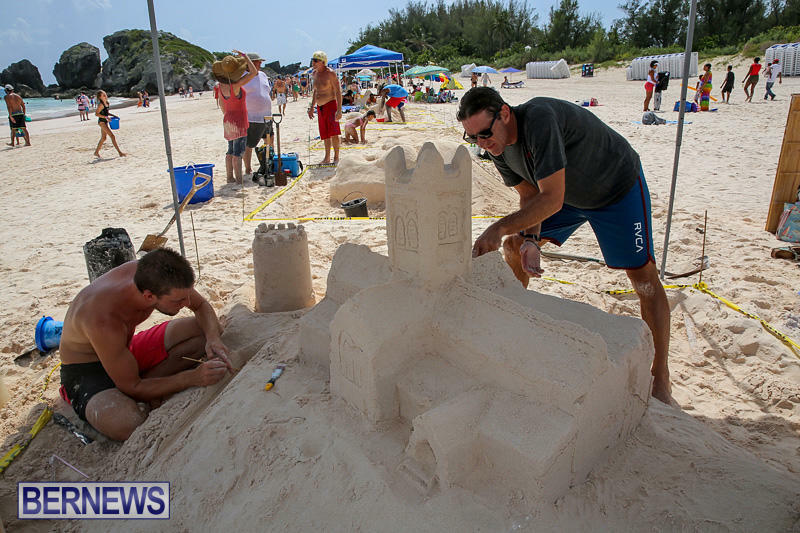 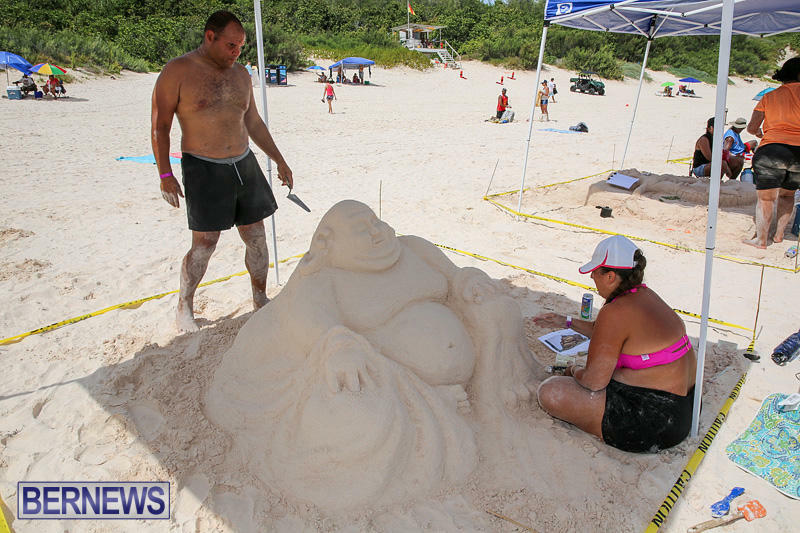 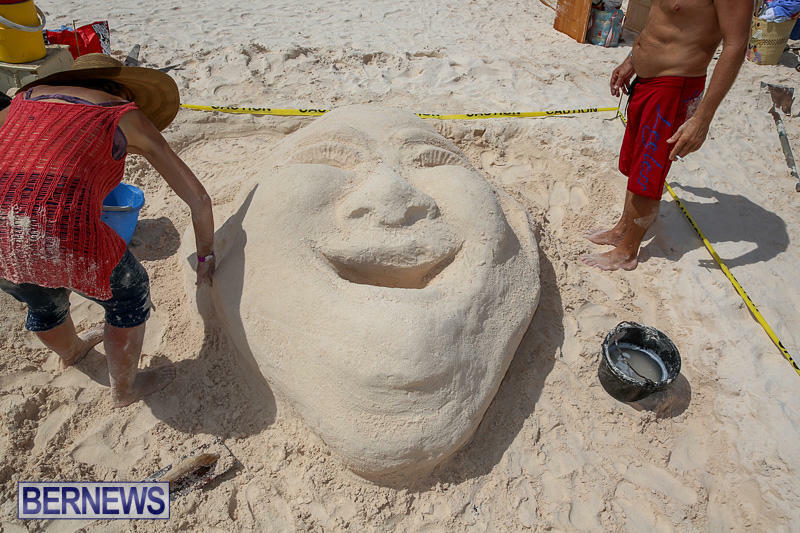 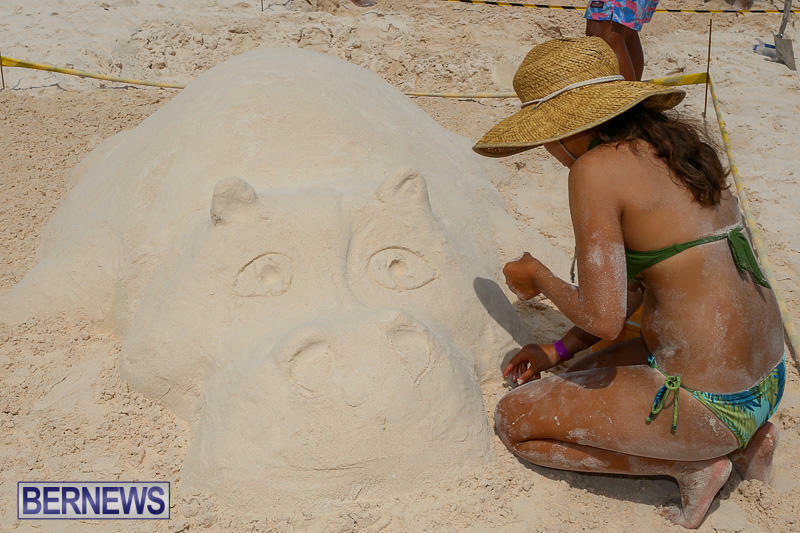 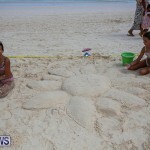 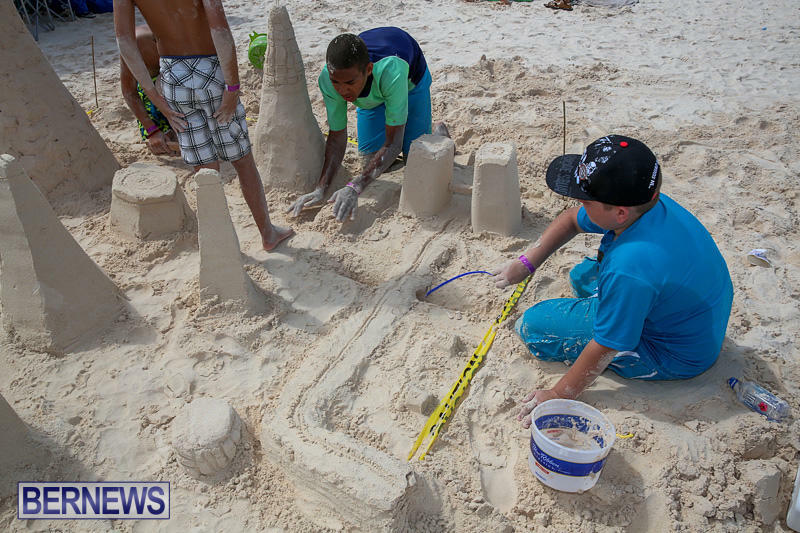 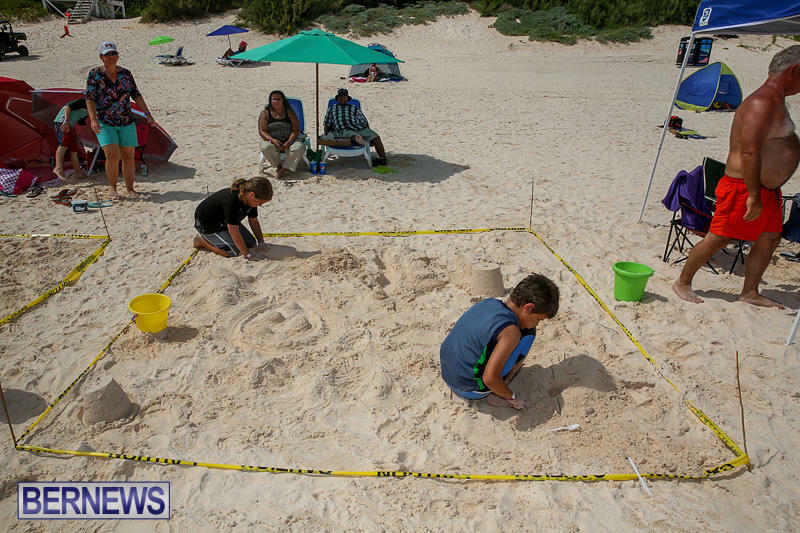 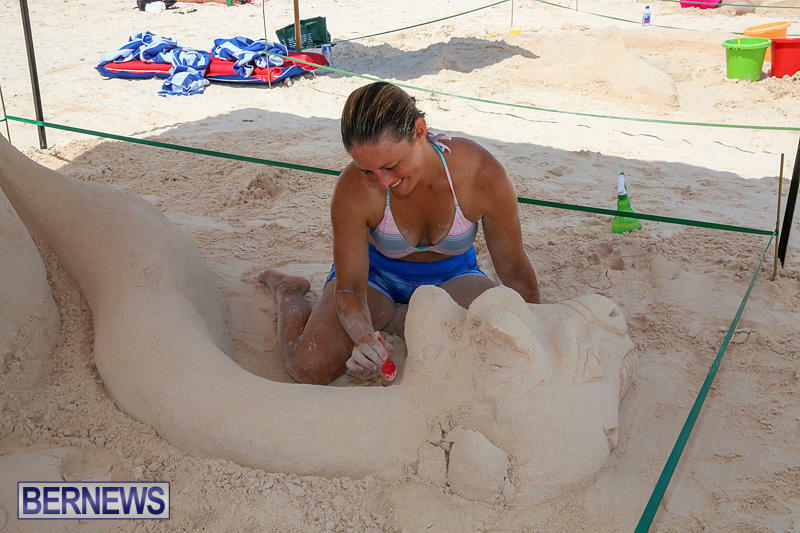 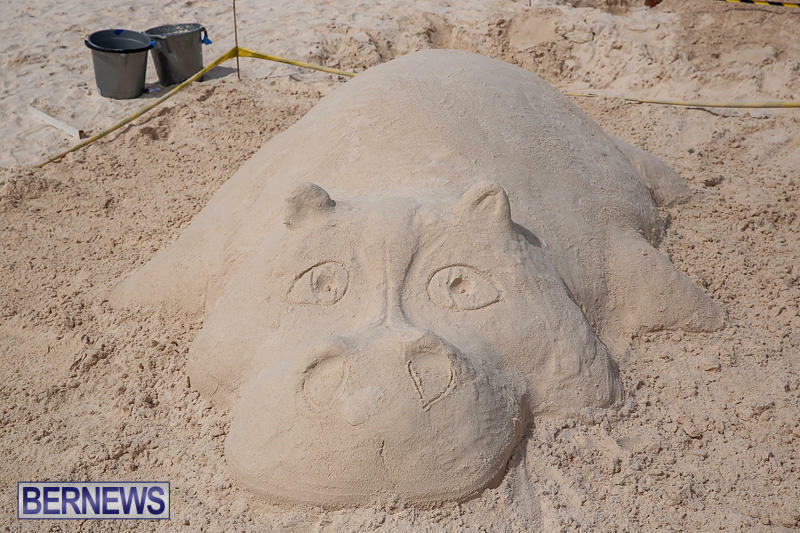 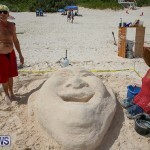 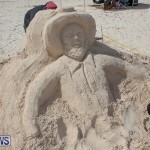 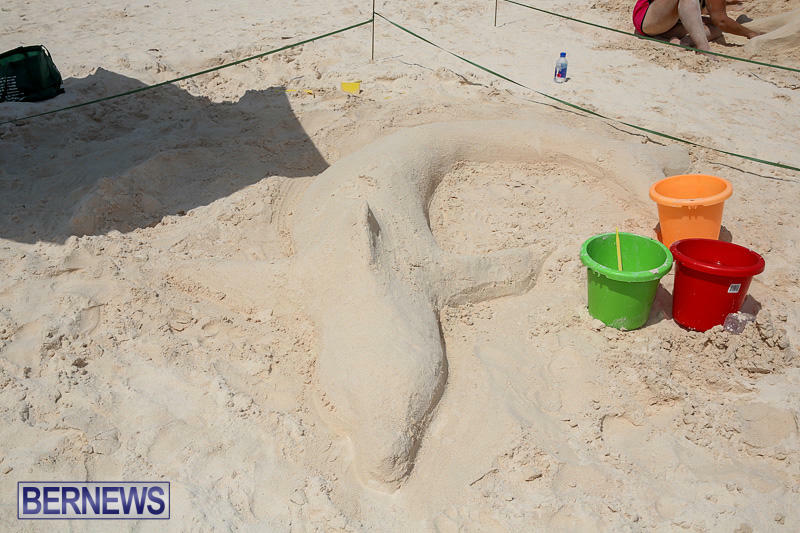 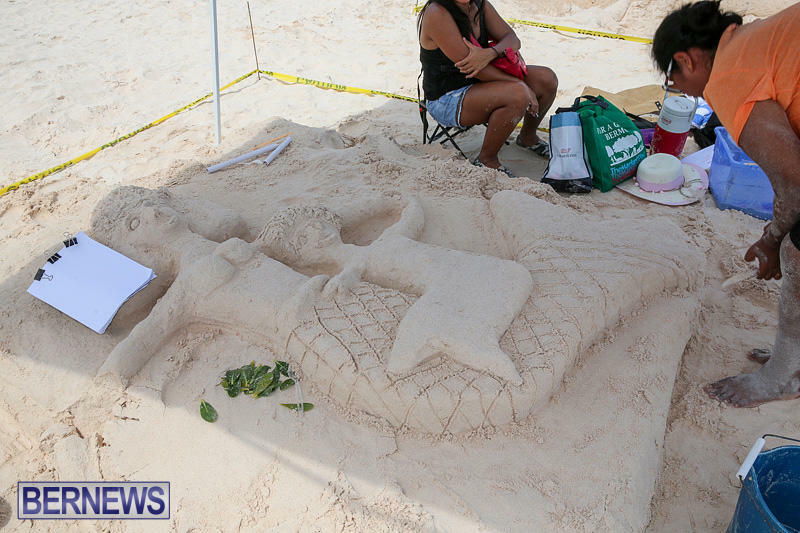 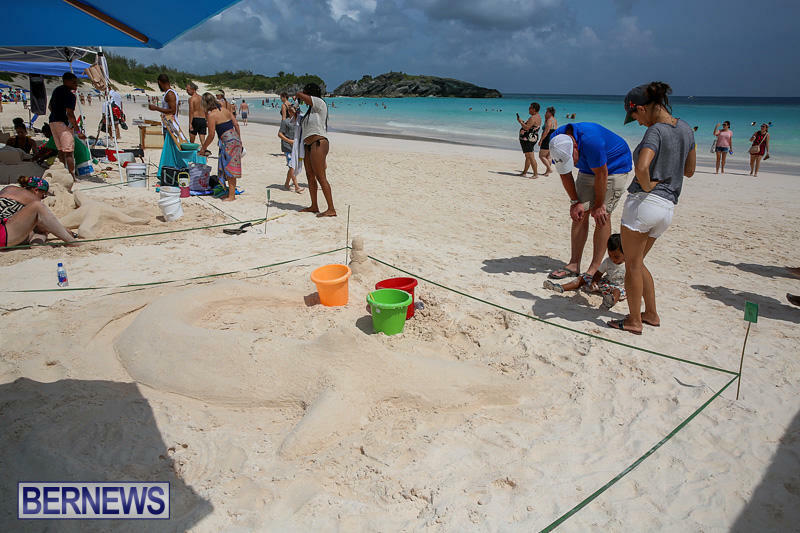 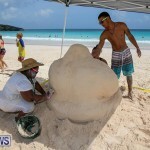 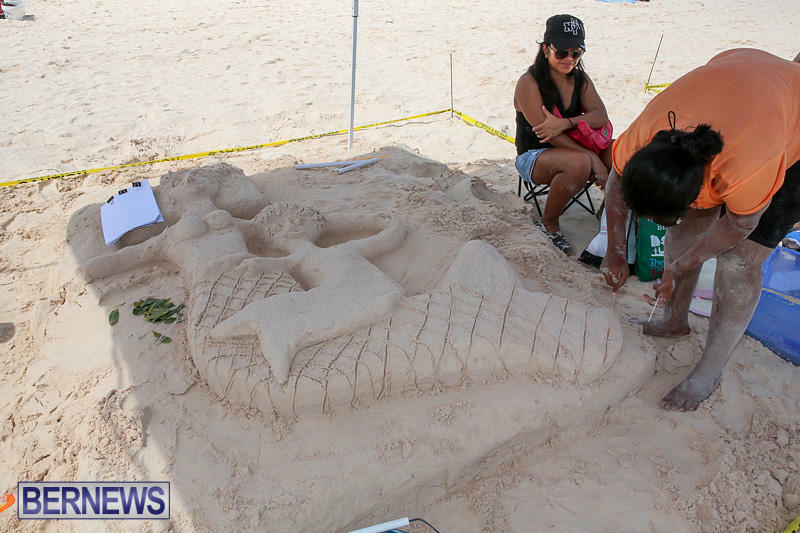 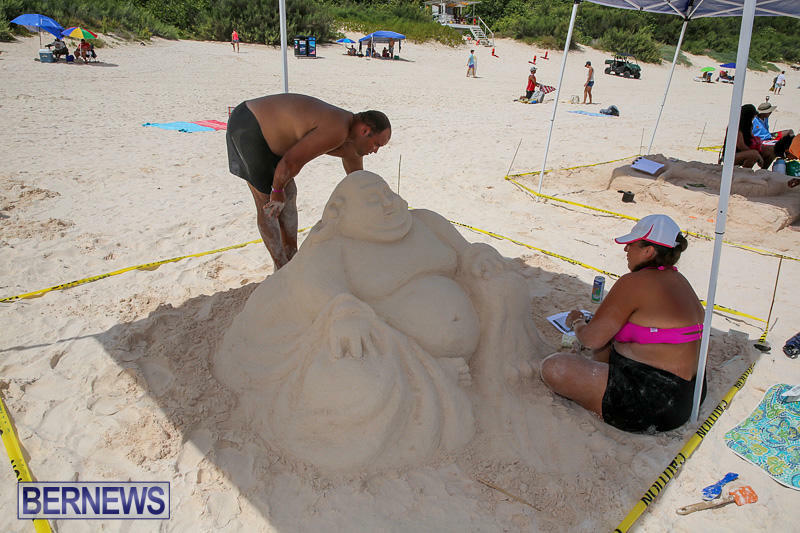 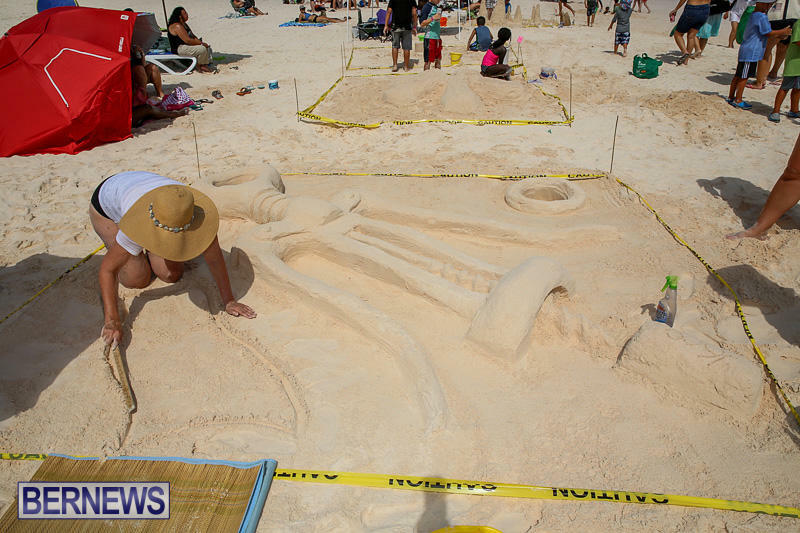 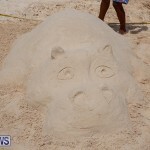 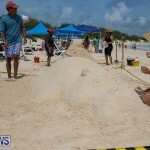 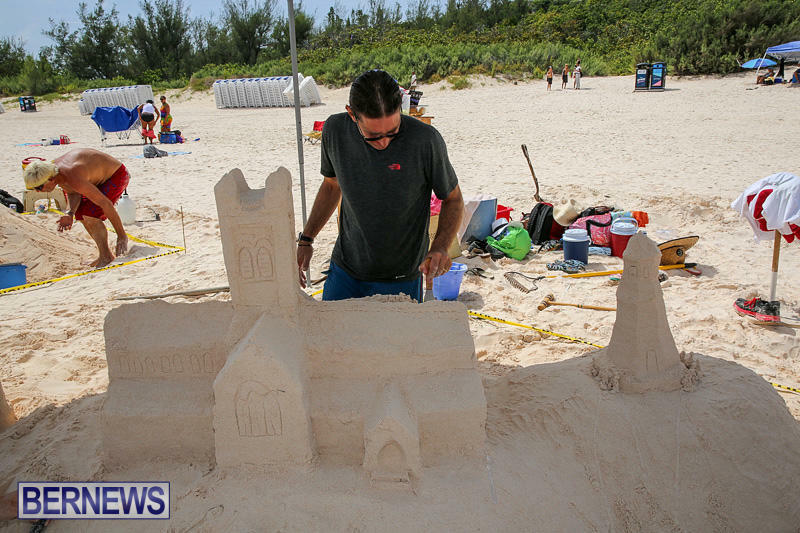 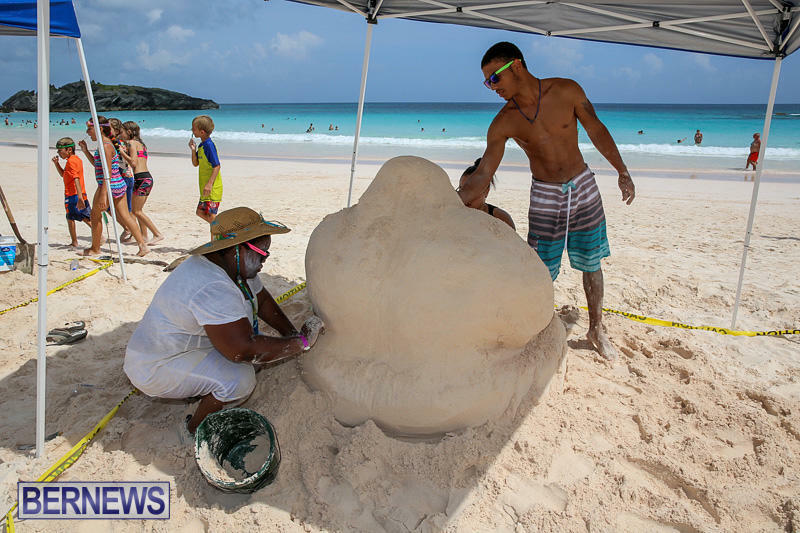 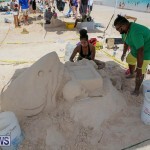 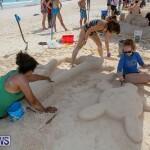 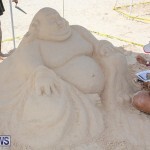 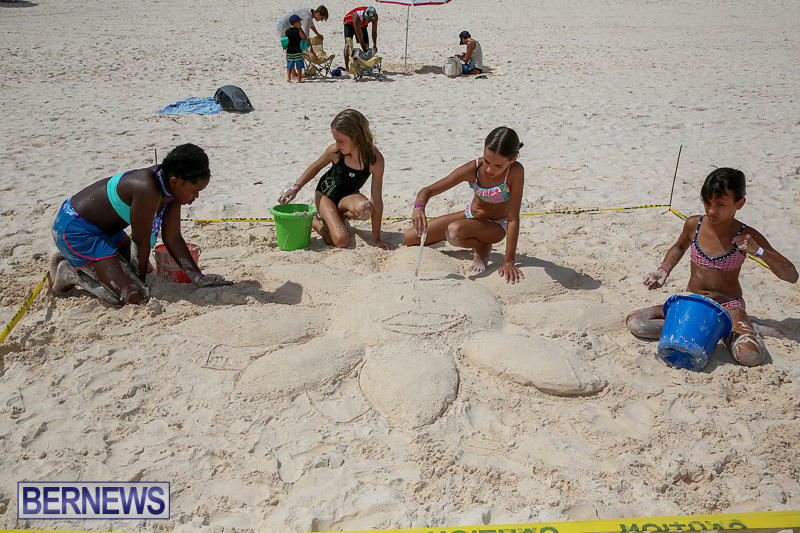 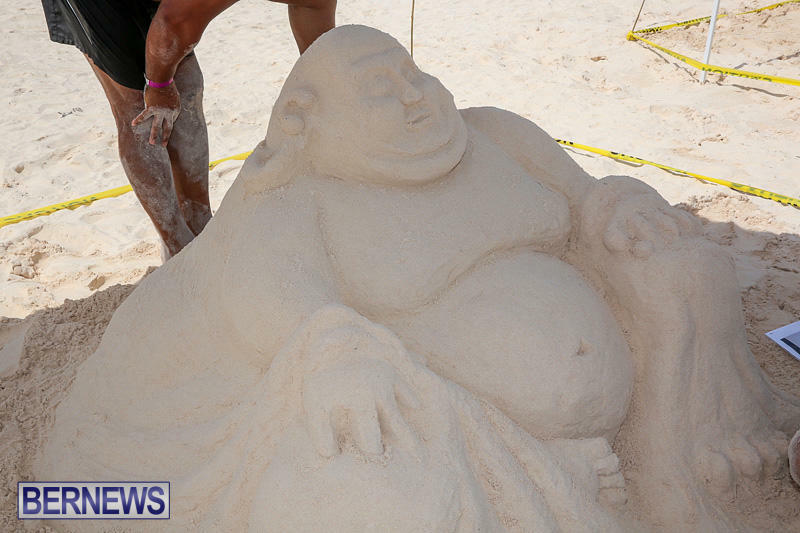 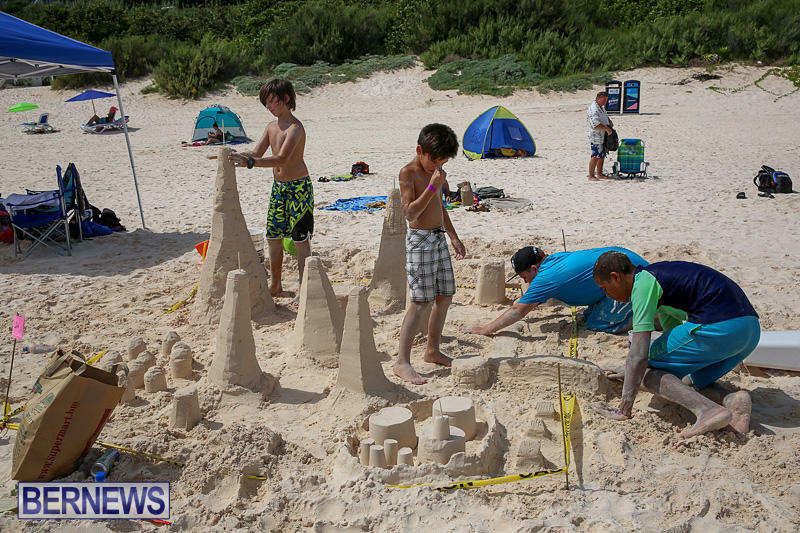 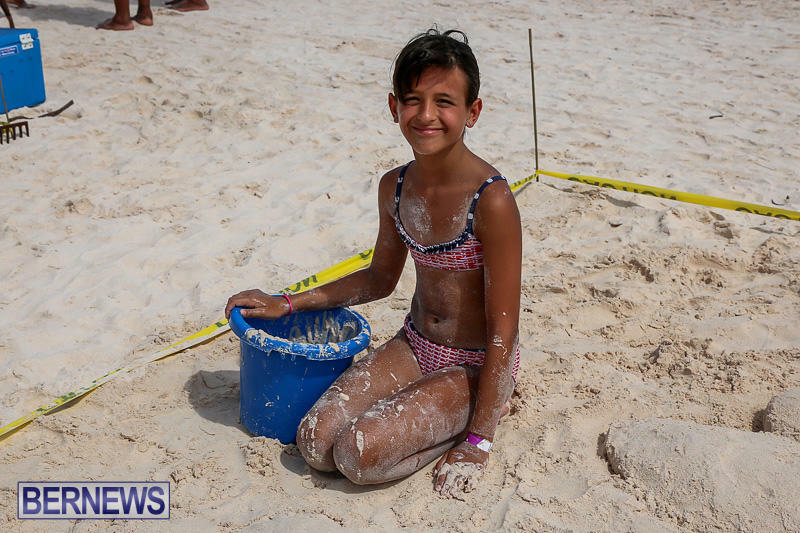 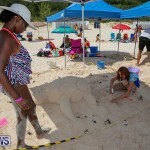 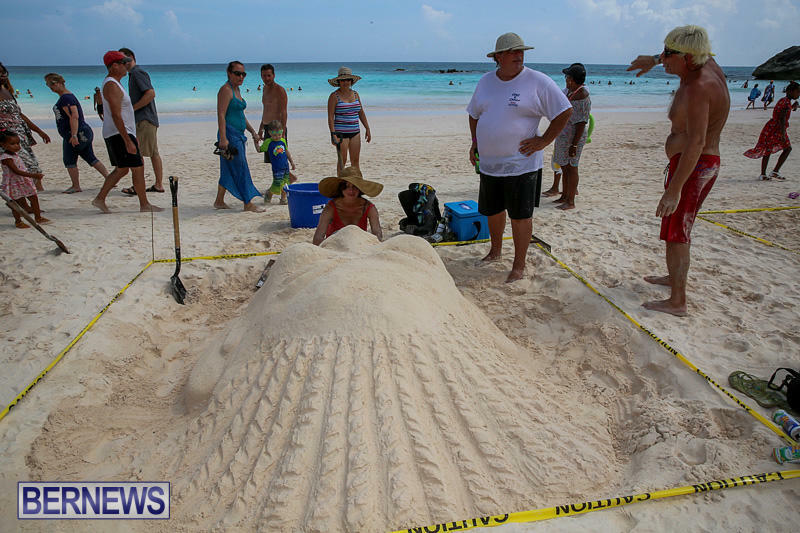 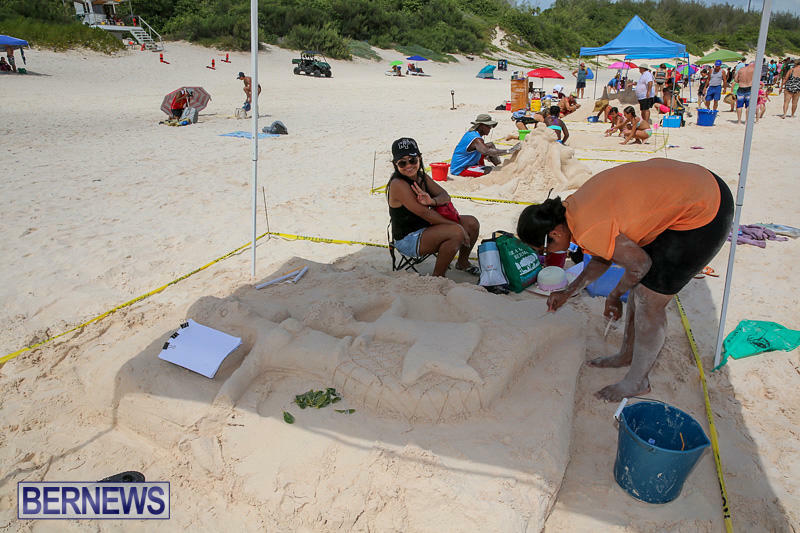 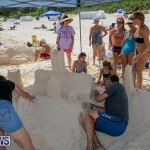 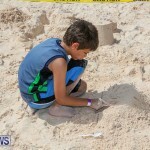 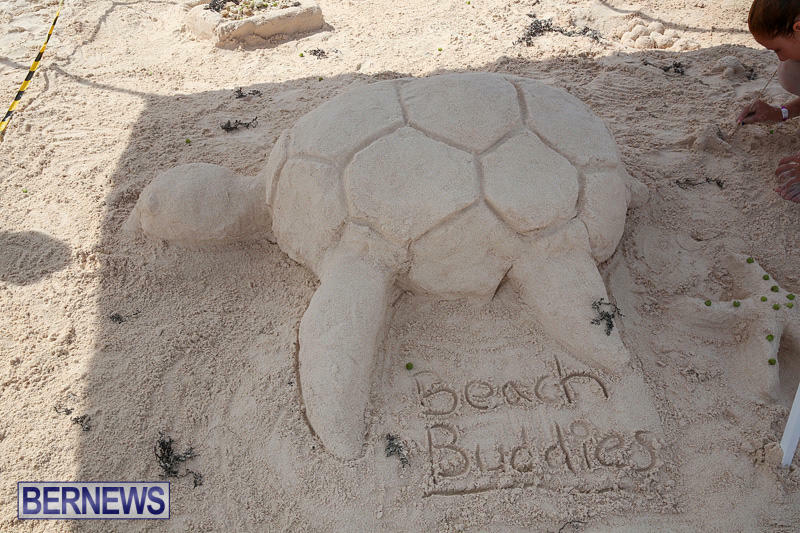 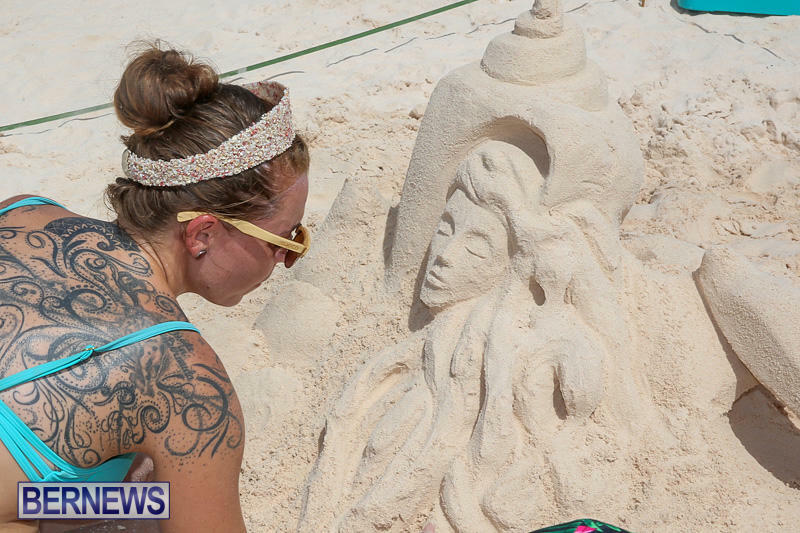 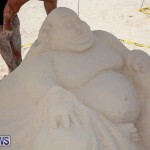 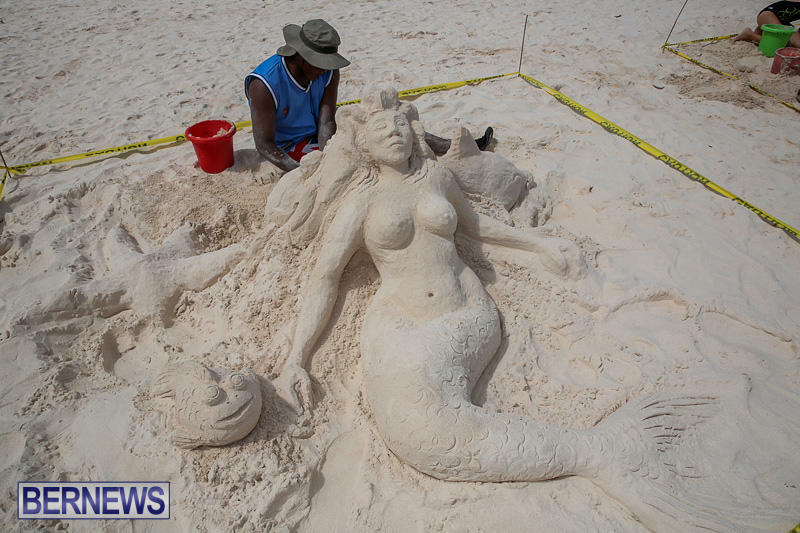 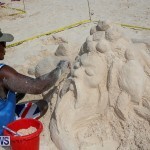 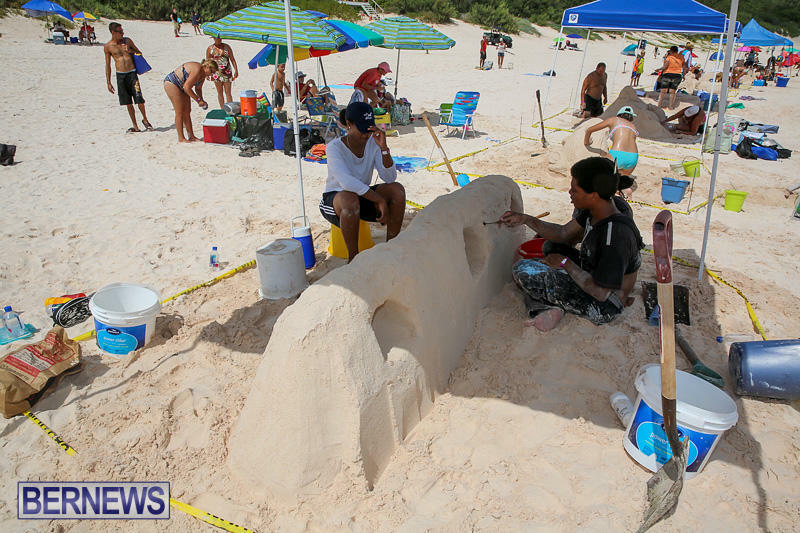 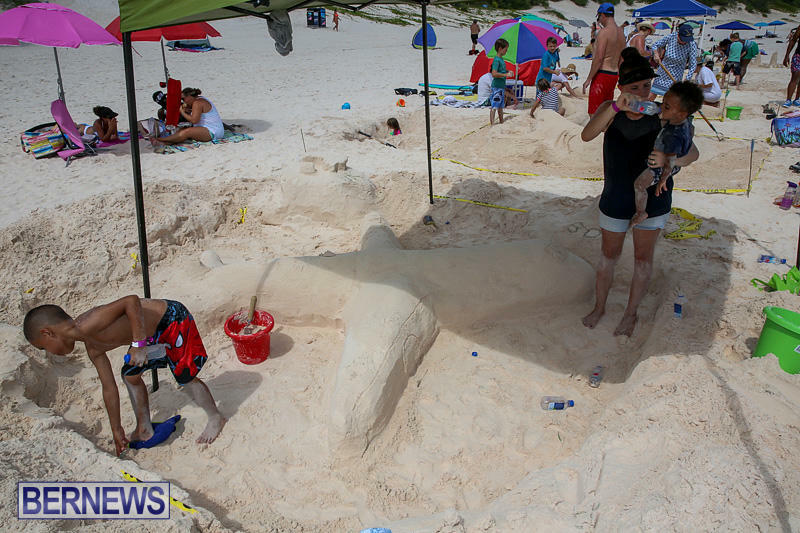 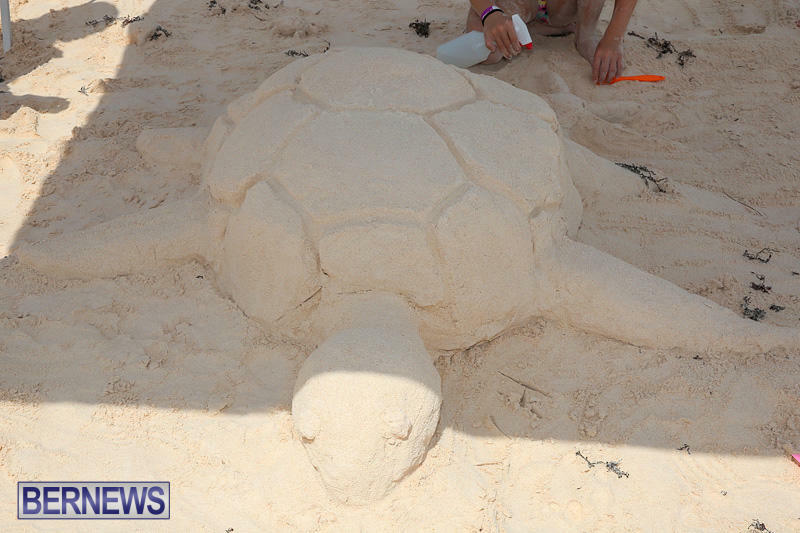 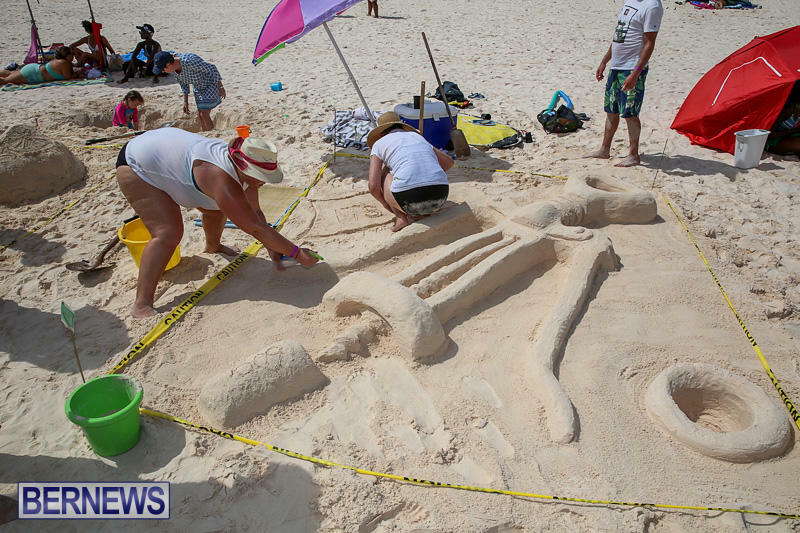 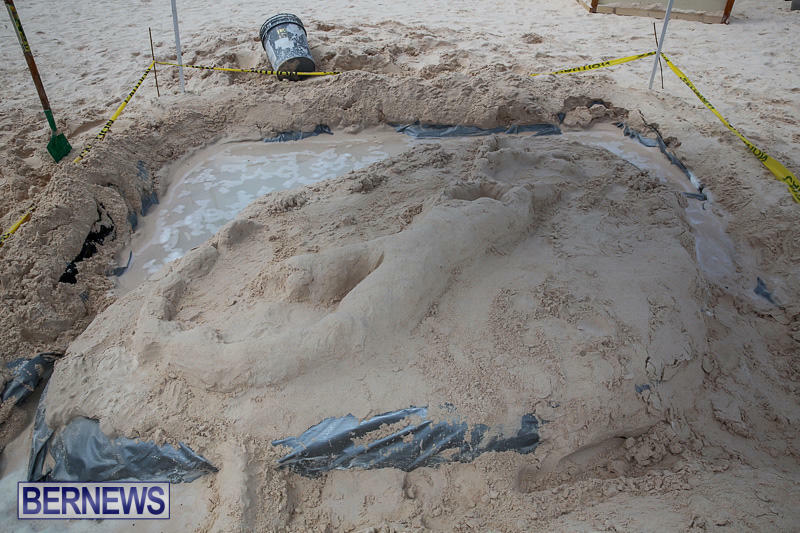 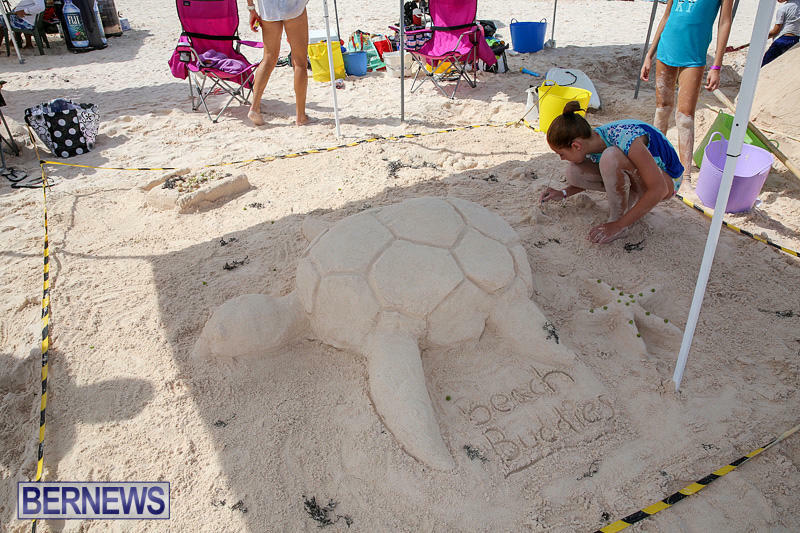 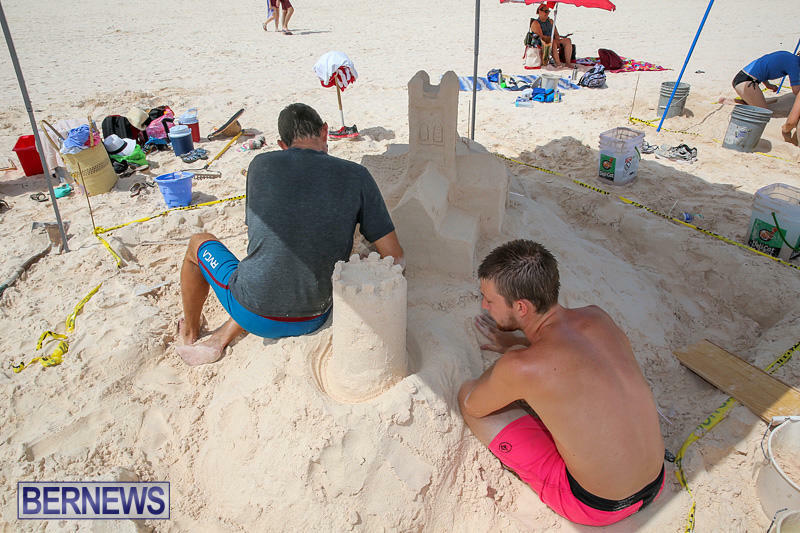 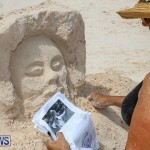 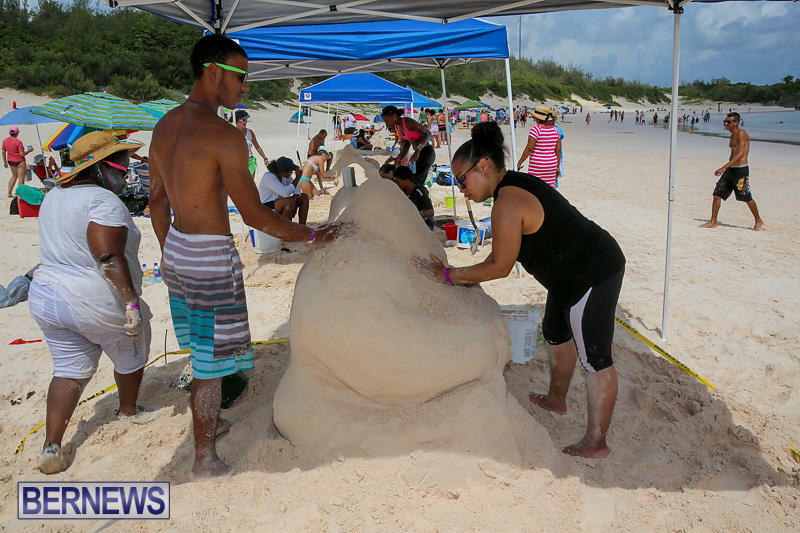 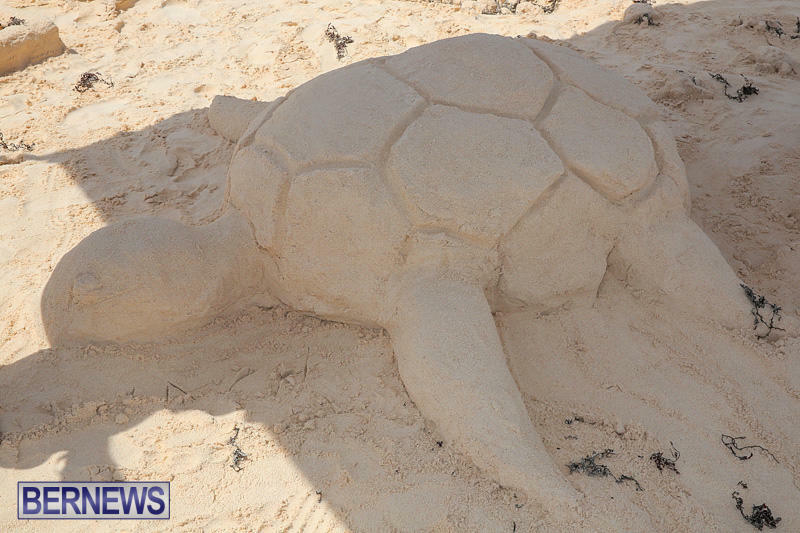 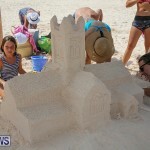 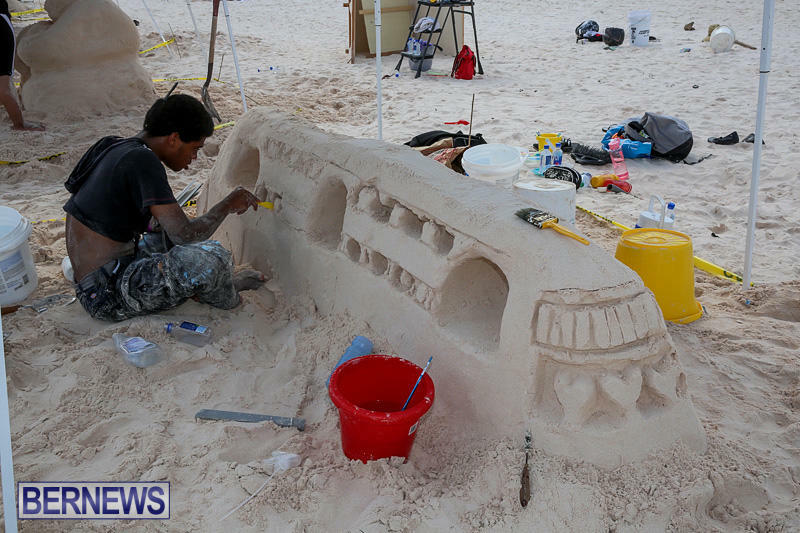 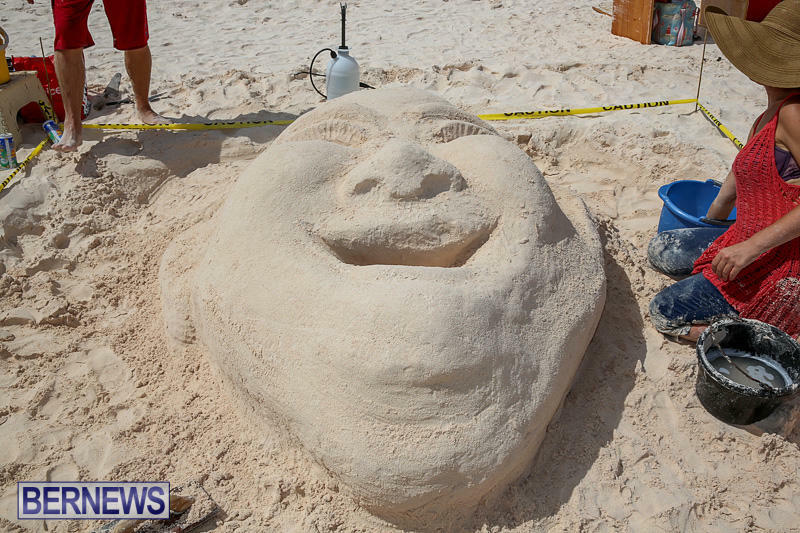 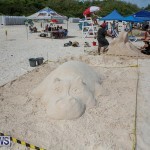 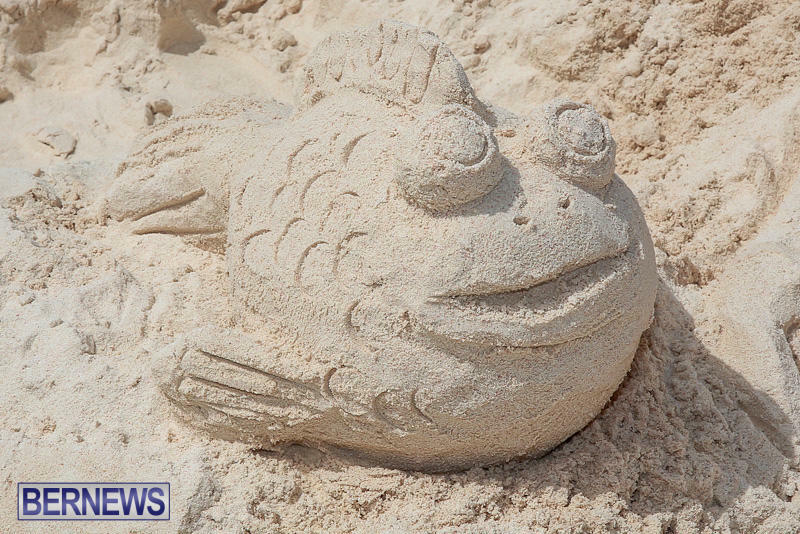 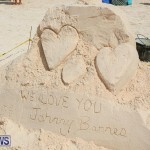 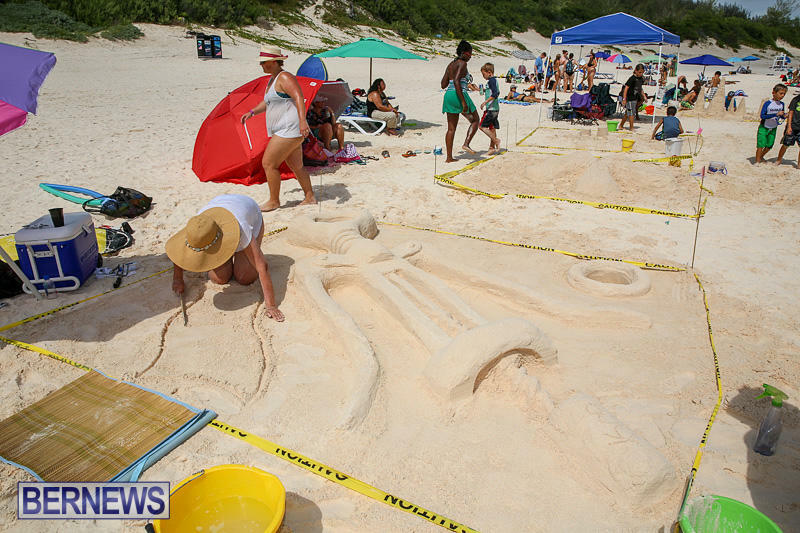 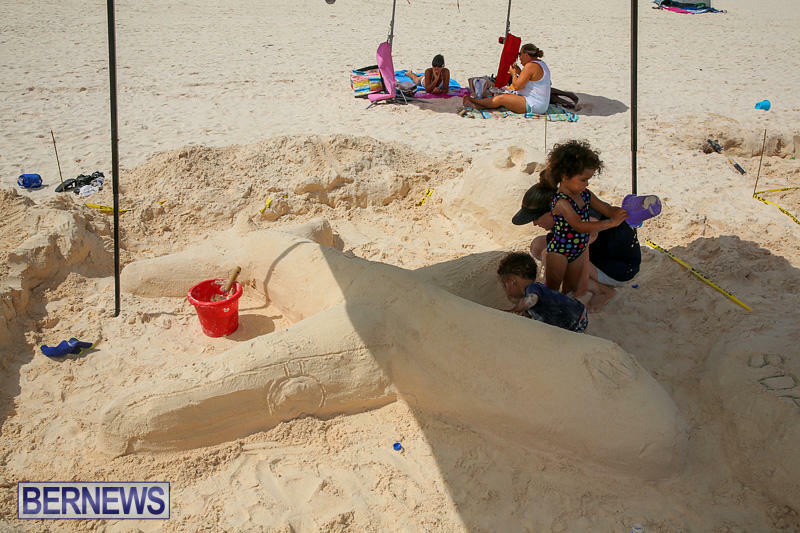 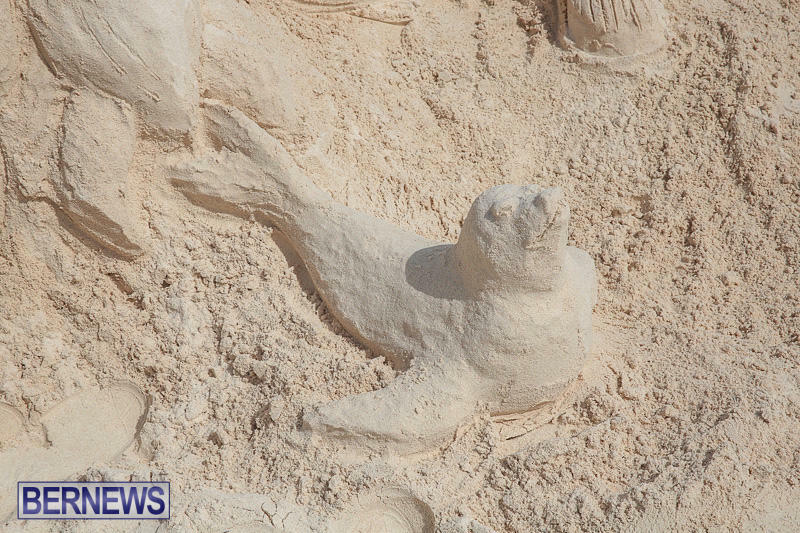 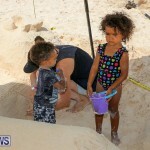 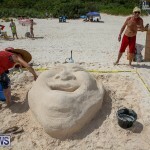 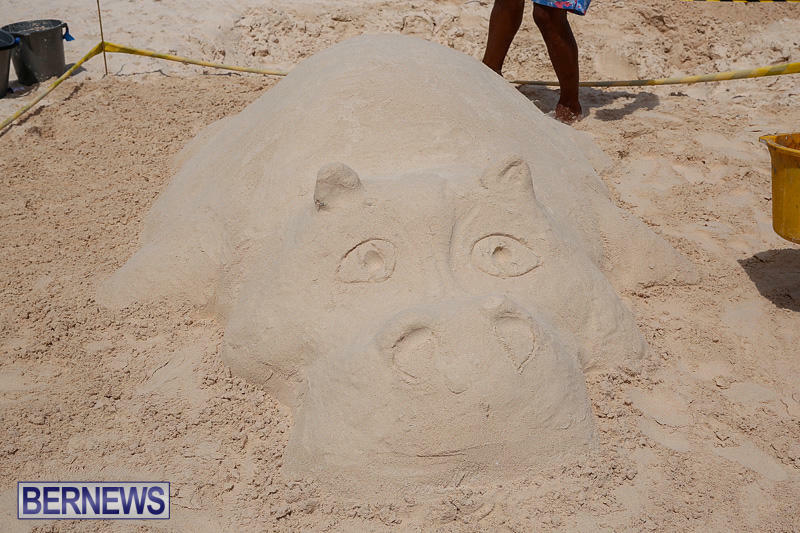 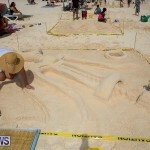 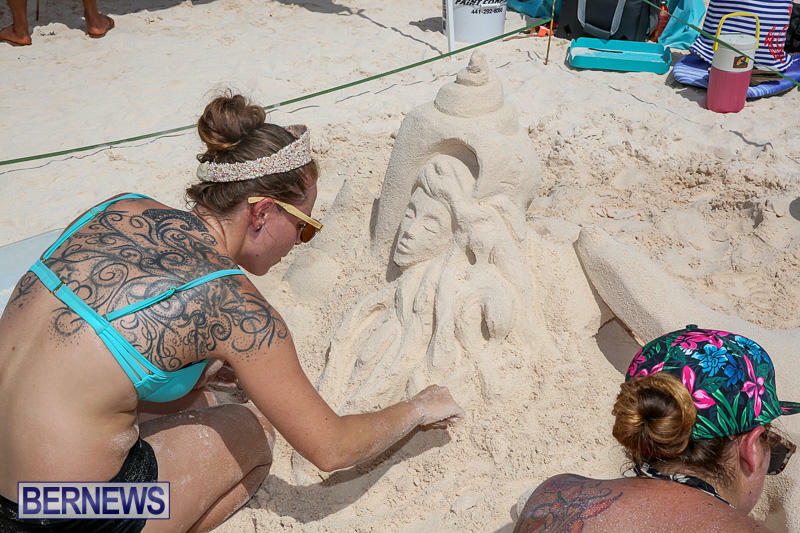 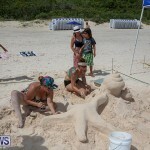 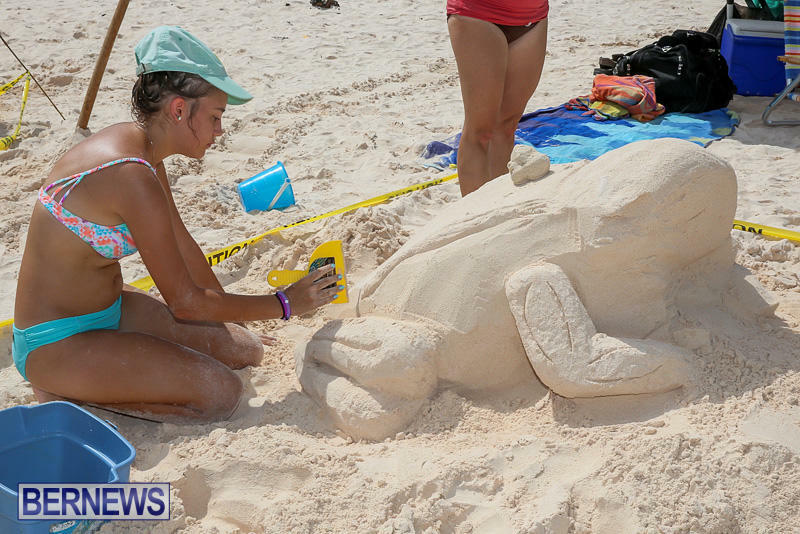 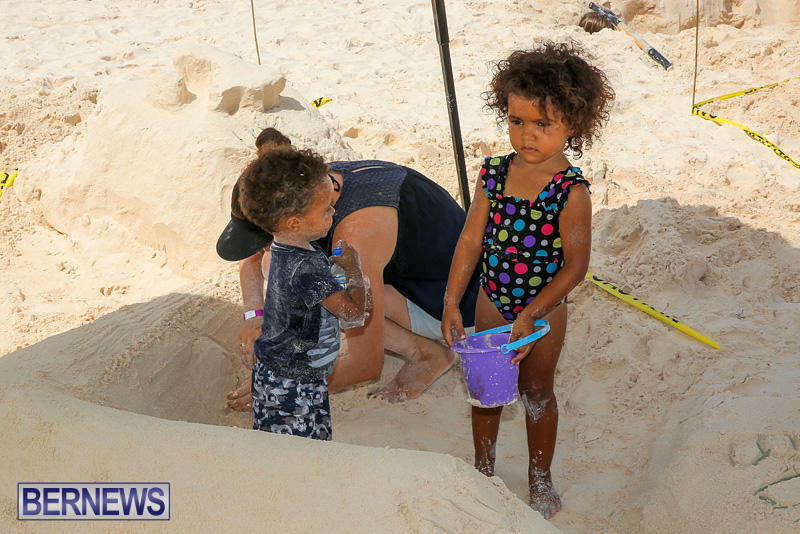 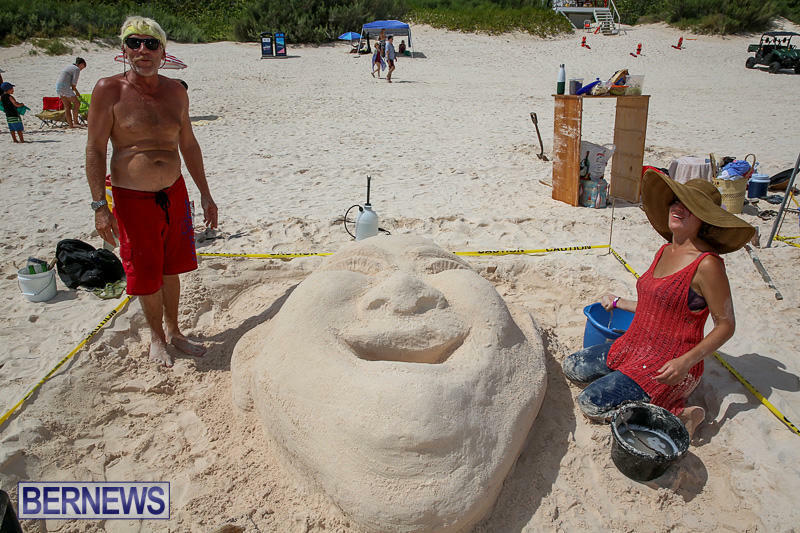 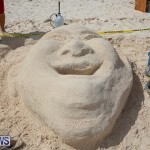 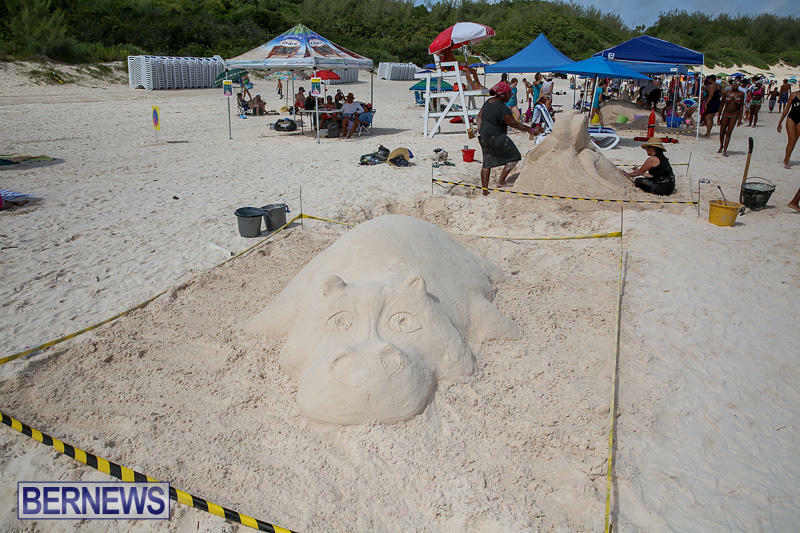 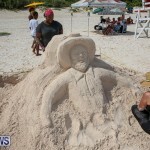 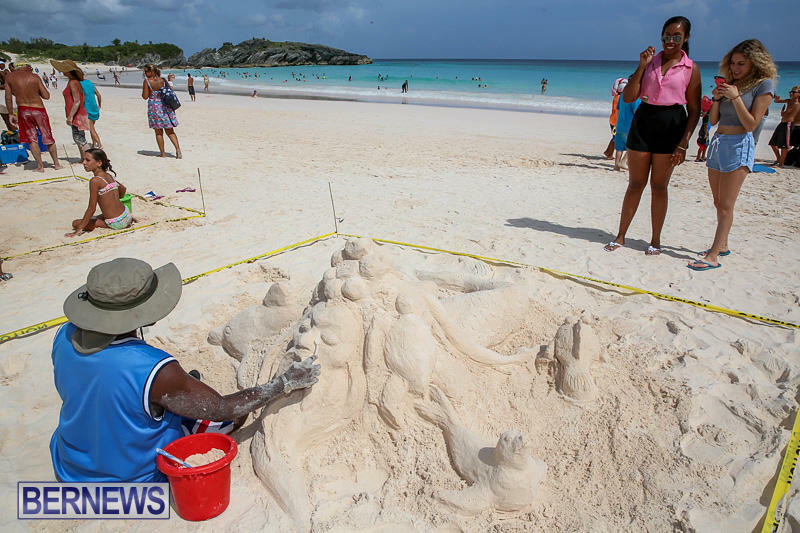 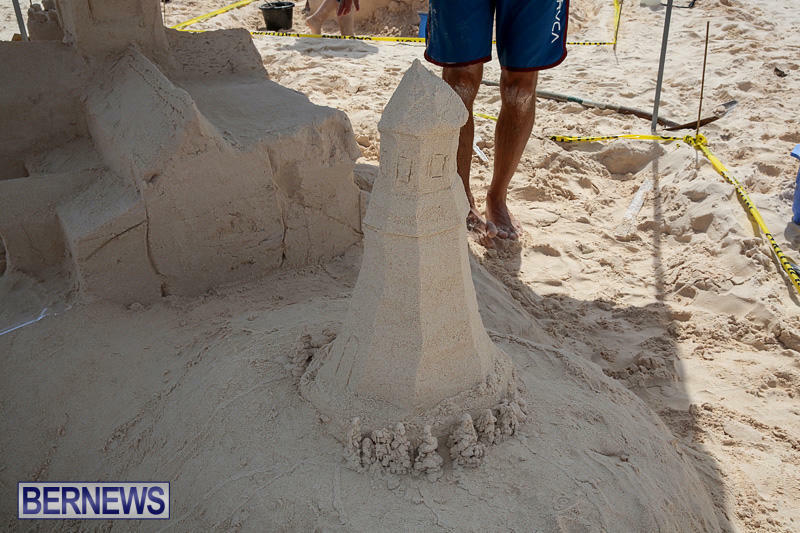 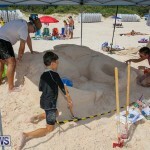 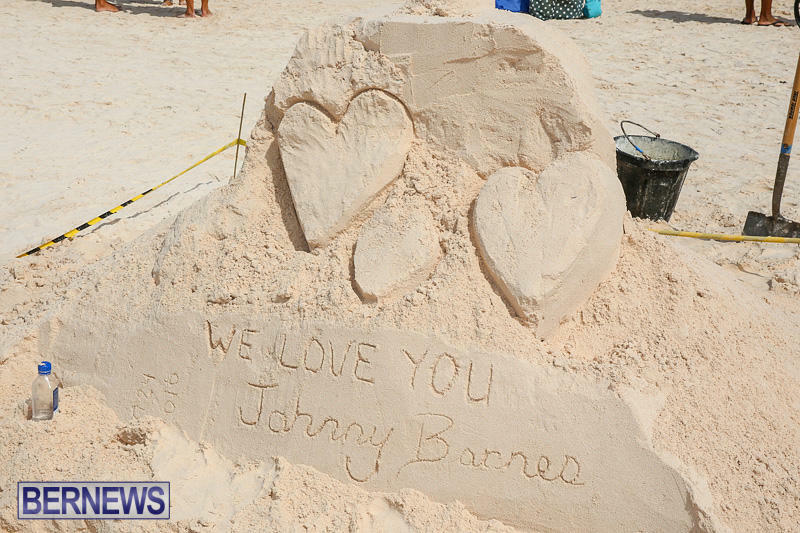 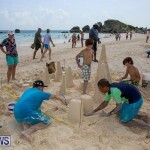 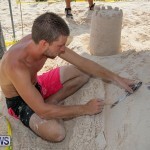 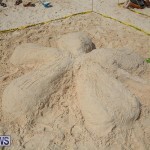 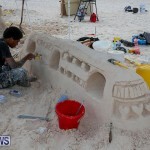 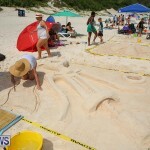 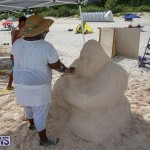 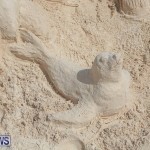 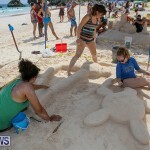 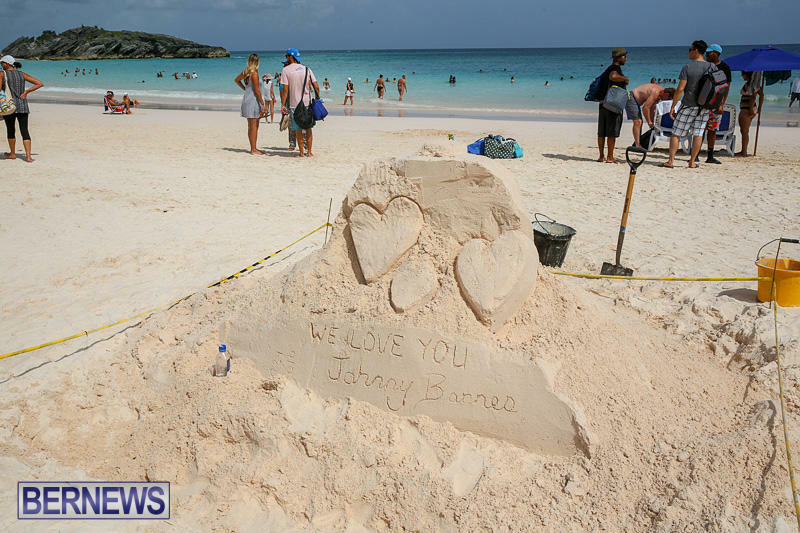 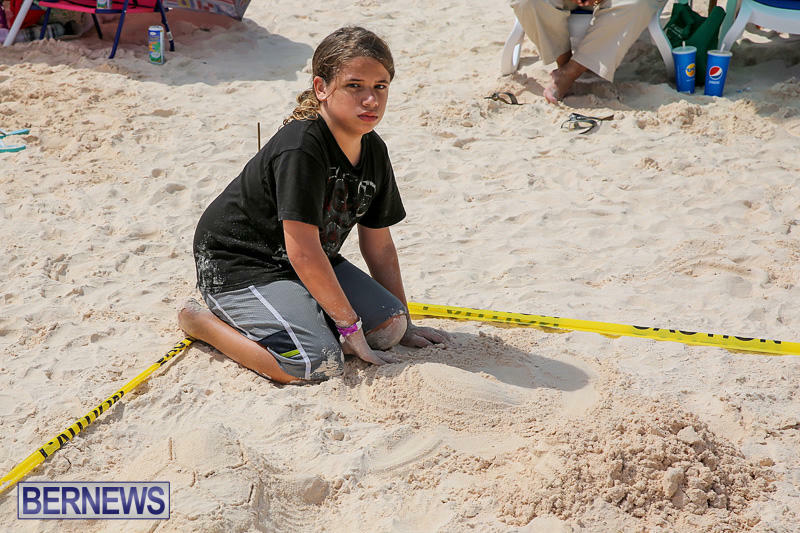 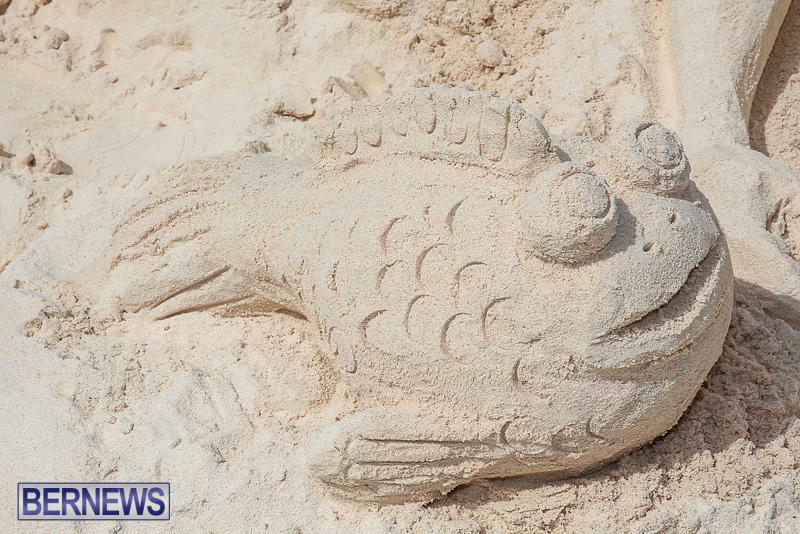 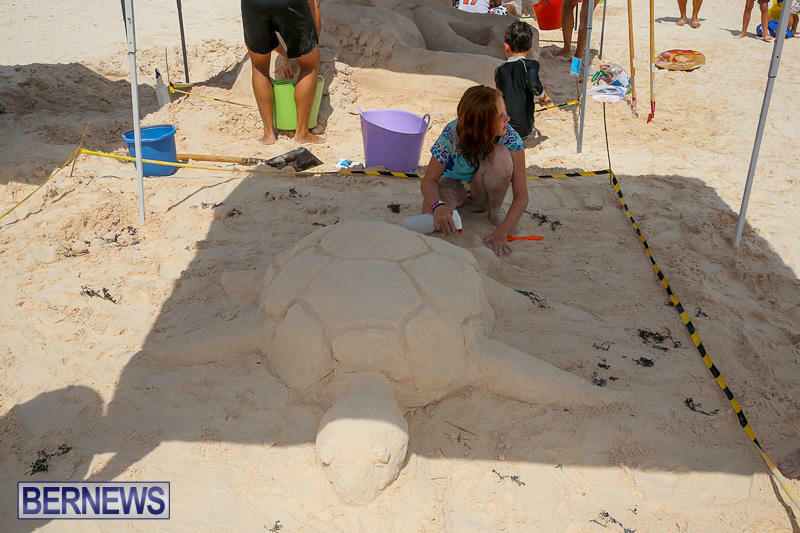 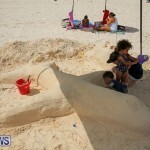 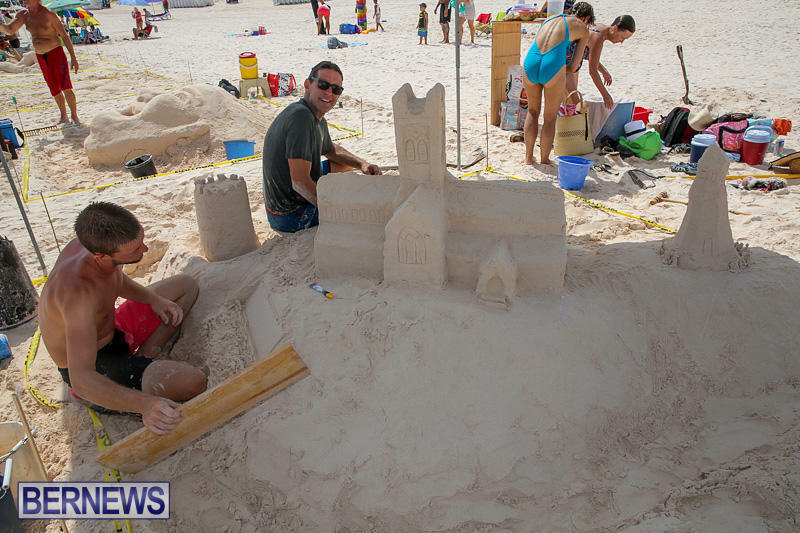 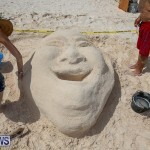 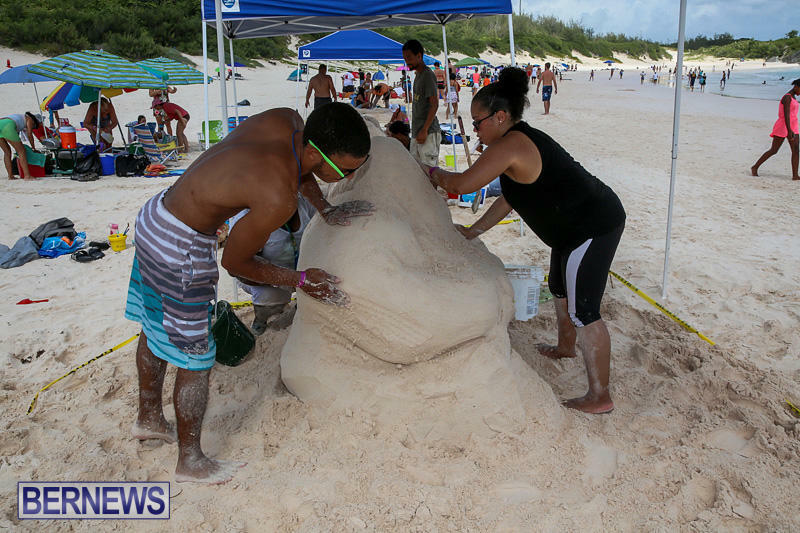 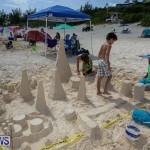 The public was invited to “unleash their creativity using Bermuda’s own natural pink sand” at the 21st annual Bermuda Sand Sculpture Competition today [Sept 3] at Horseshoe Bay, with $2,000 in cash prizes given away. 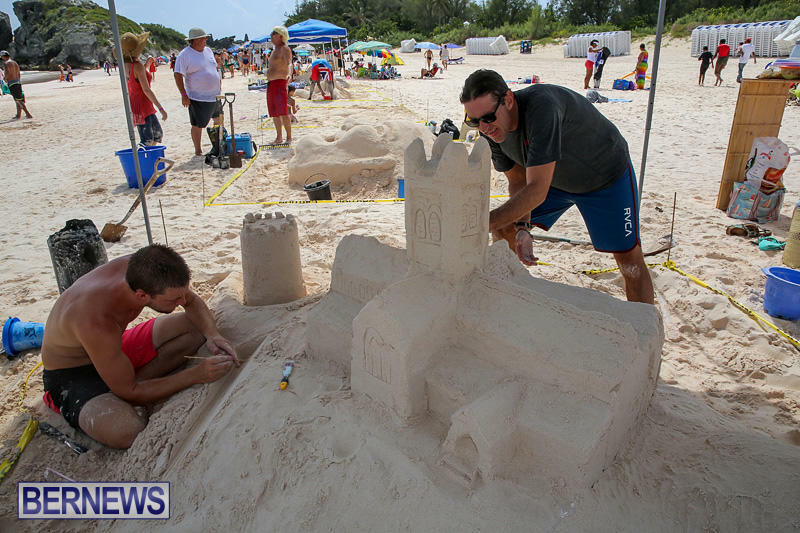 The competition was sponsored by the Hamilton Princess and Beach Club and Marina and Alexandra Mosher Studio Jewellery, with free admission for both spectators and participants. 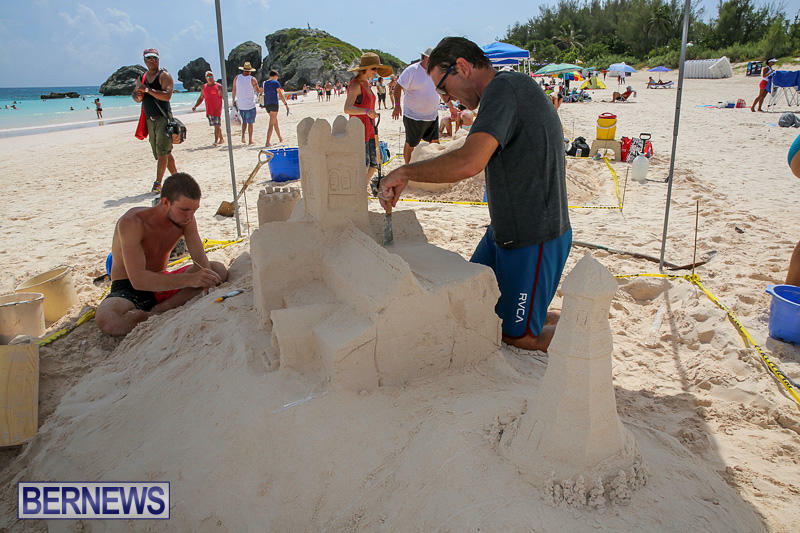 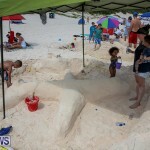 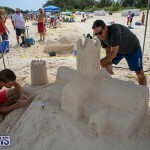 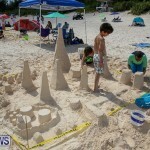 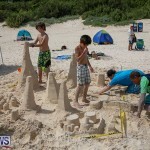 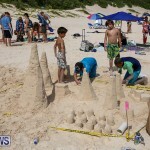 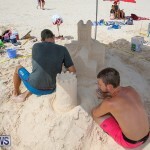 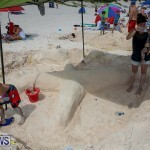 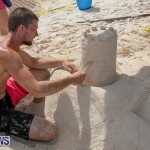 A spokesperson said, “There was a remarkable turn out for the 21st annual Bermuda Sand Castle competition held on Horseshoe Bay. 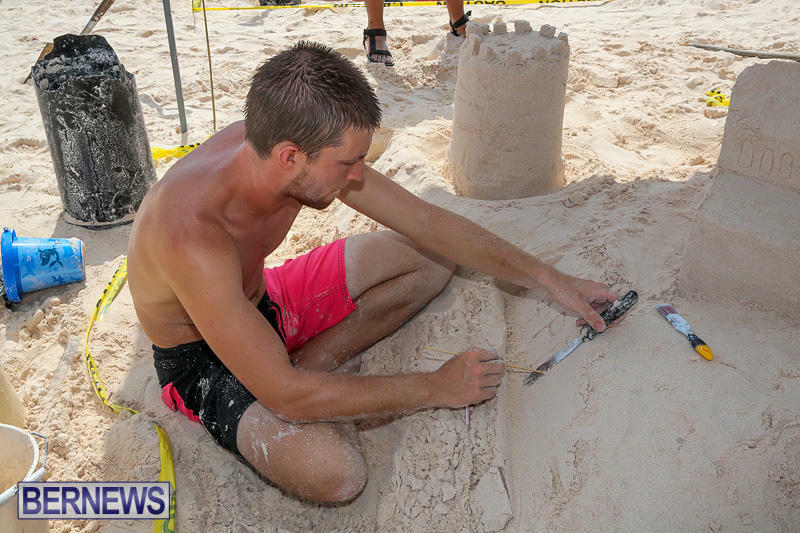 The competition lasted from 10 until 4 with 26 teams of up to 6 toiling away on their fantastic creations in near perfect conditions. 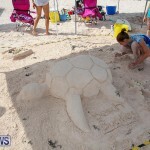 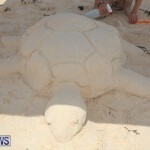 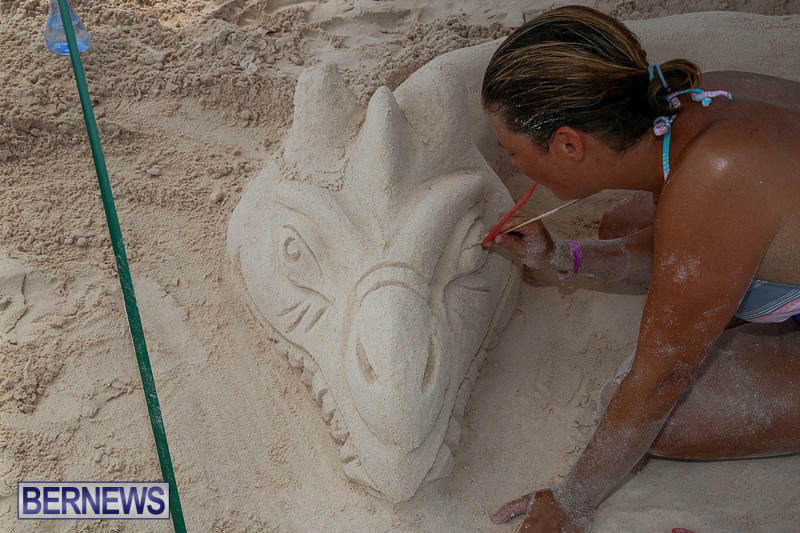 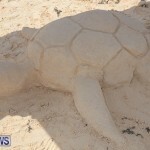 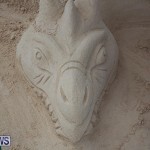 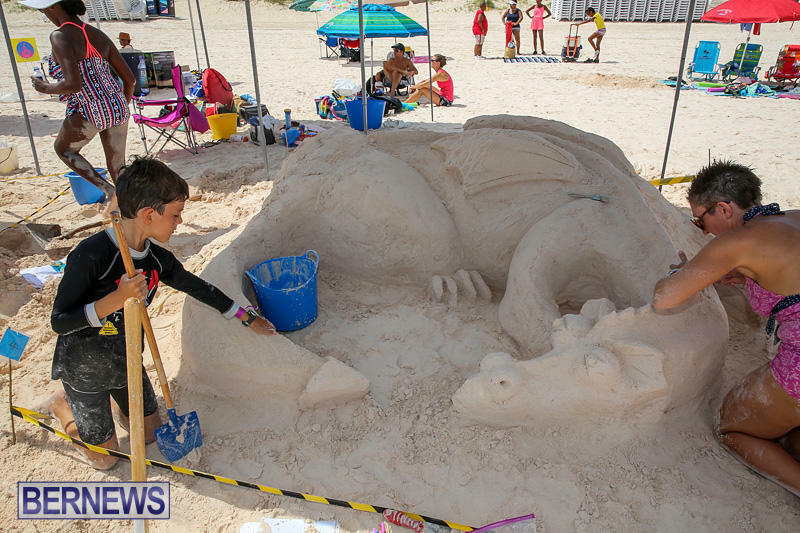 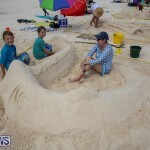 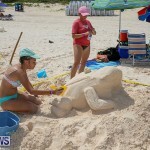 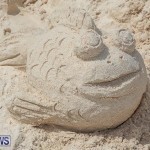 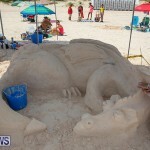 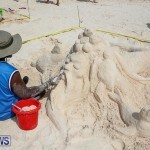 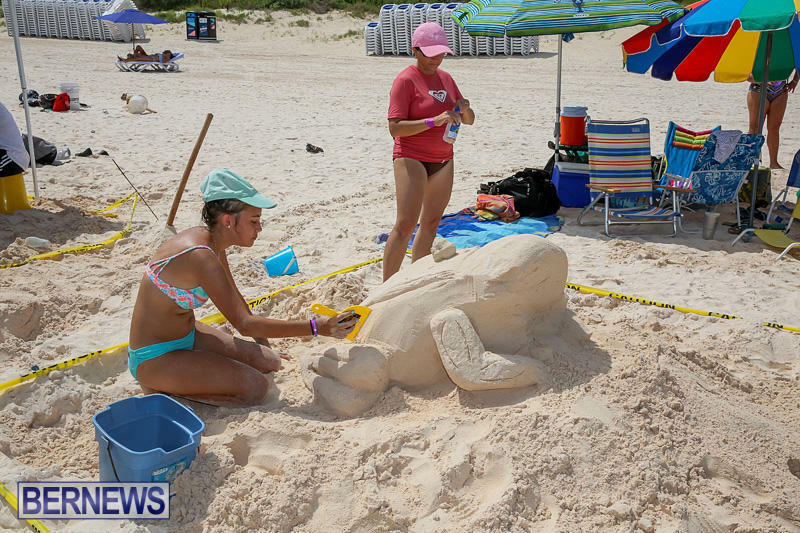 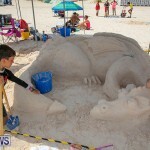 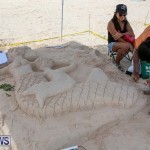 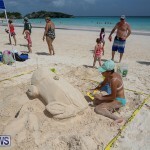 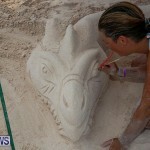 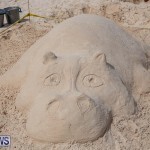 “Hundreds of locals and tourists traipsed up and down the beach enjoying the spectacle of sculptures ranging from adorable frogs and turtles to giant dragons and intricate corkscrews. 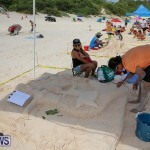 “The categories of participants included families, teenagers, children and the open category, each showing immense skill. 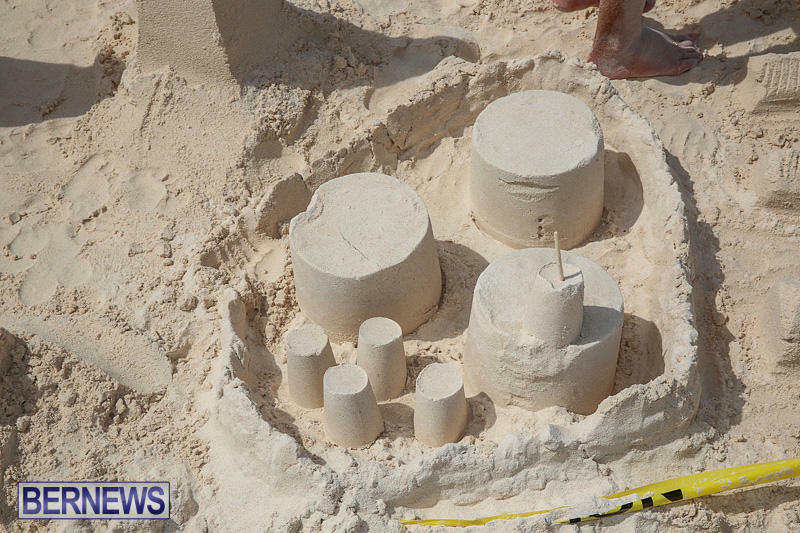 The judges arrived to begin their deliberations just after 4 with Alexandra Mosher from Mosher Jewelry and Studio design, Colin Campbell, an architect and Lynne Matcham, a Marketing specialist. 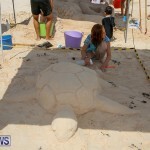 They were so blown away by the level of talent that a special mention prize had to be added to the ranks! 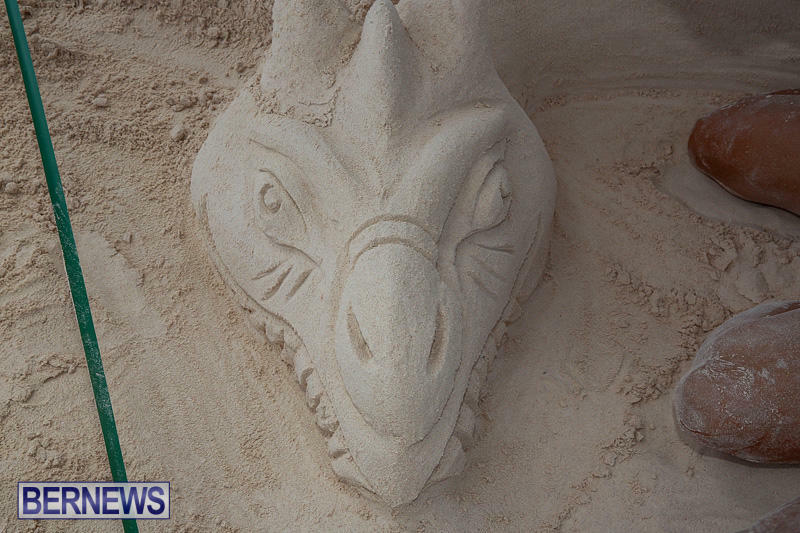 “The overall winners were the highly talented team of Hannah Emmerson and Mikal Thomas who created a spectacular castle with a swirling dragon wrapping its body around the base. 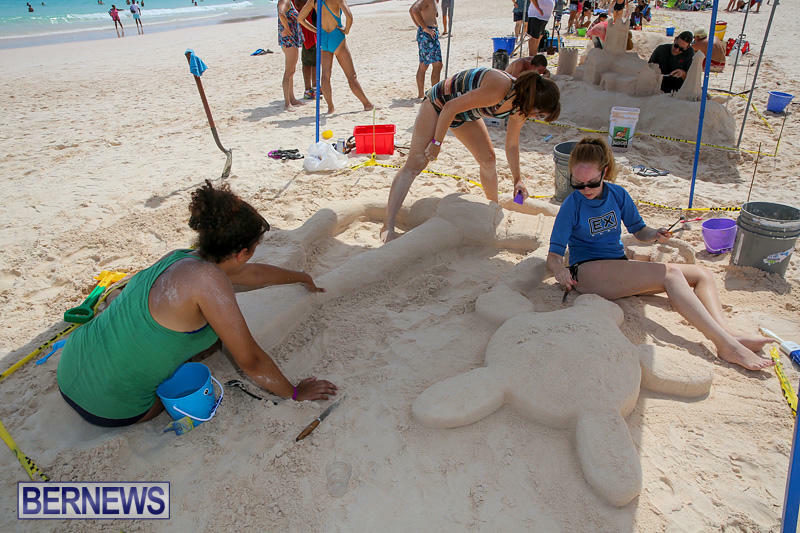 The piece was called the last castle, fitting as Hannah Emmerson will be taking over the sand sculpture competition next year and this was her last opportunity to participate. 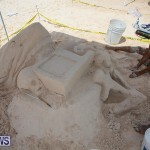 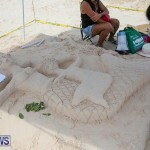 The sculpture showed a high level of skill and creativity of concept. 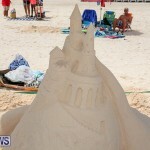 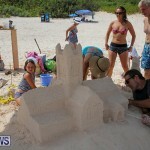 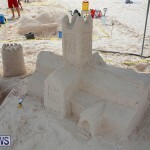 “The ‘last castle’ was not the only wonderful creation on the beach. 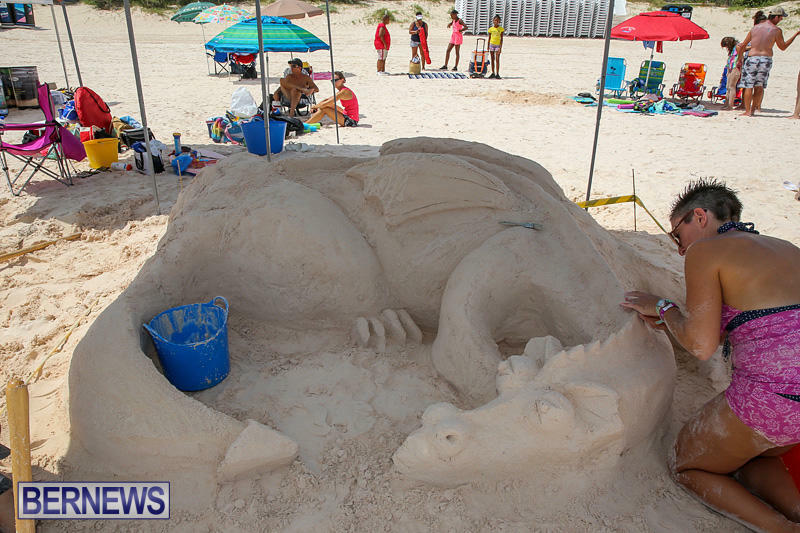 The 1st place prize within the family category was to the Hastings family with a wonderful dragon creation. 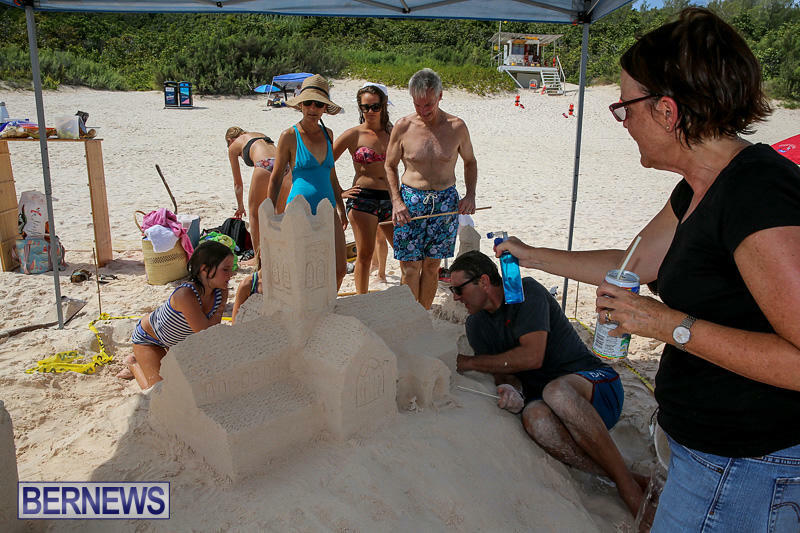 In a close second, came the Dill family with a Cathedral construction and third place was awarded to the Divine family for their airplane. 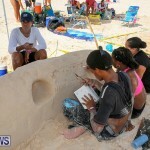 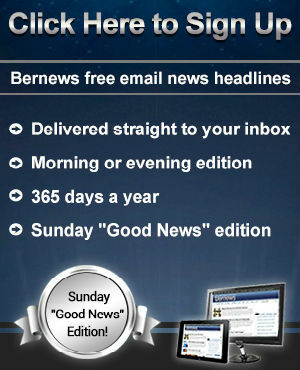 “Within the teenage category there were 2 prizes awarded. 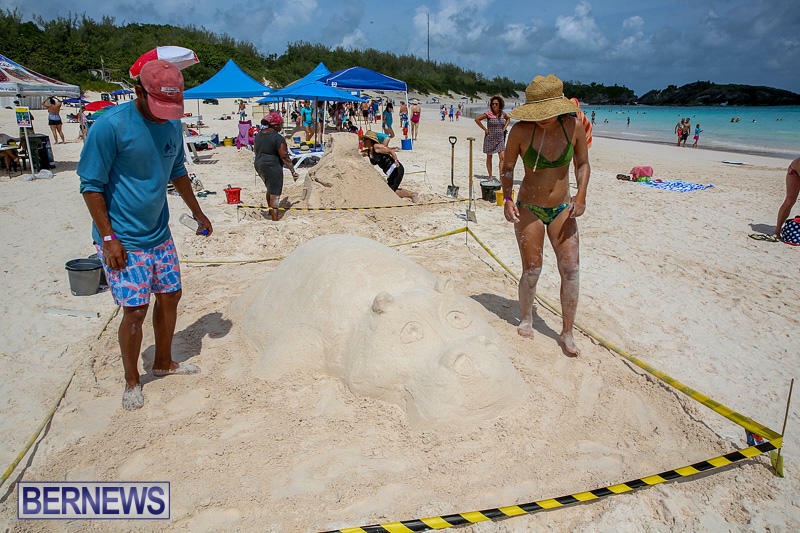 First place was awarded to Fiona Dobson and Kristina Grant for their snorkeler and turtle with second place to Camille and Christian Chin-Gurret for their Hippo basking in the sun. 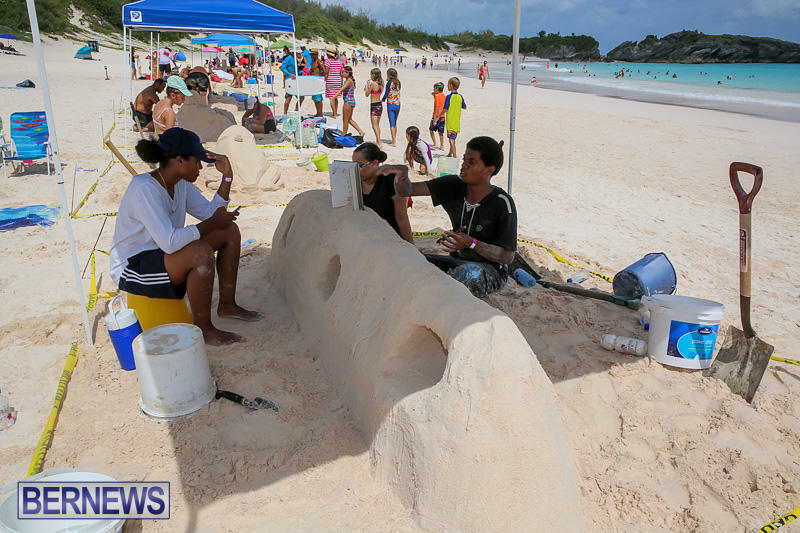 “The children’s category showed an astounding level of skill and a bright future for Bermuda’s art scene with first place being awarded to Maximo Deiros, Gideon Wheddon and Constantino Deiros building a scene of towers. 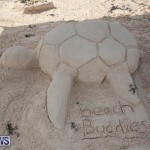 “Second was the Beach Buddies team, Elsie Hastings, Rhiannon Nester, Mia Hazelwood, Anna Larrett, Sydney Bucci and Gianna Lupparelli for a turtle with its babies hatching from eggs. 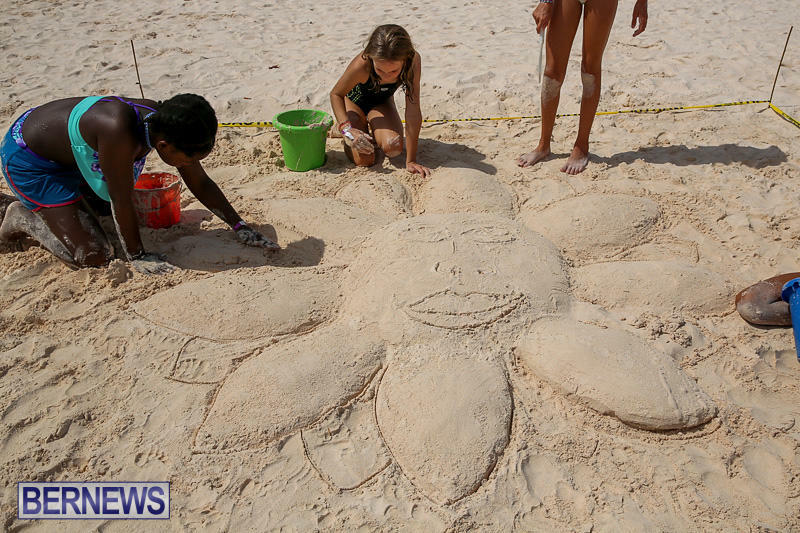 Last but not least was third, awarded to a glorious sunflower created by Ava and Jasmin Gabai-Maiato, Zoe Hasselkuss and Zavia Doyling. 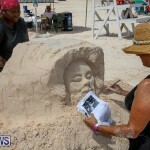 “Finally, the open category demonstrated some extraordinary aptitude. 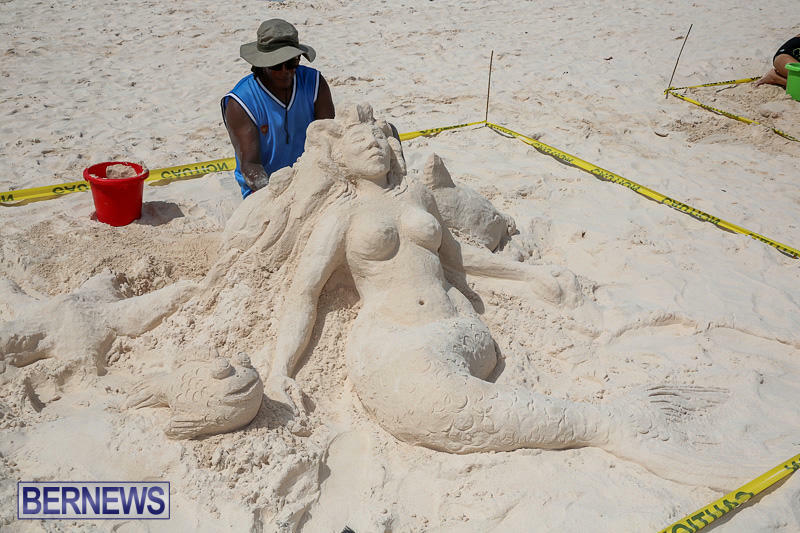 In first place was Leonard Ming for a Mermaid surrounded by a variety of sea creatures. 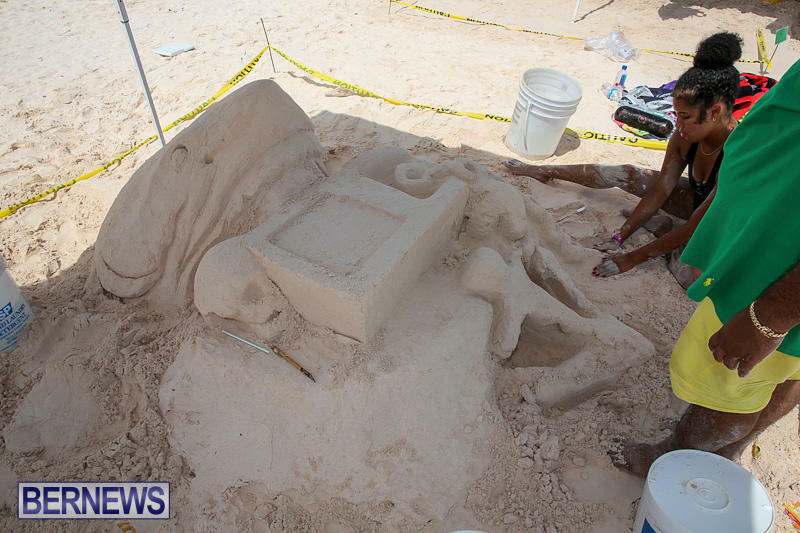 Second place was the Bermuda College Numero Uno team with a shark biting into a treasure chest. 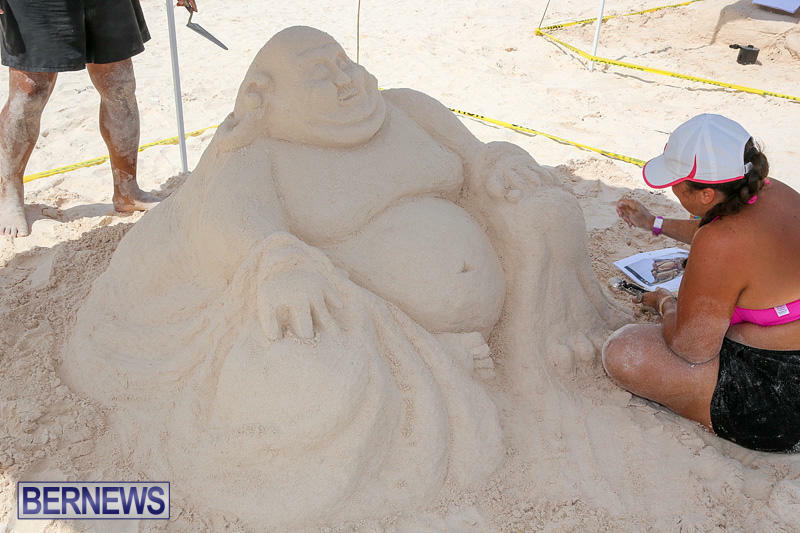 For third place there was tie of a Buddha created by Tammy and Charles Dowling and a vast Corkscrew by the team from OBM. 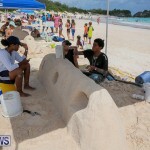 What a wonderful event to demonstrate the artist talent on our island. 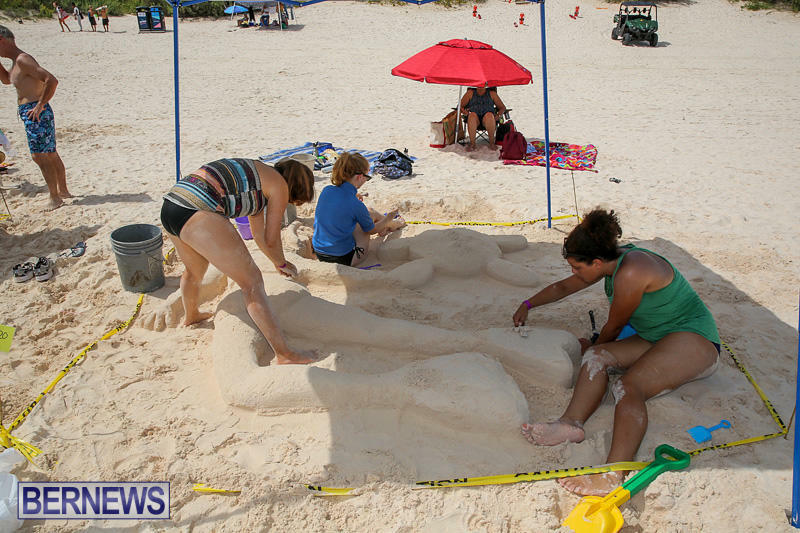 Thanks to the sponsors and all who created a sculpture – it was wonderful to see the parking lot full at Horseshoe Bay for such a creative occasion.